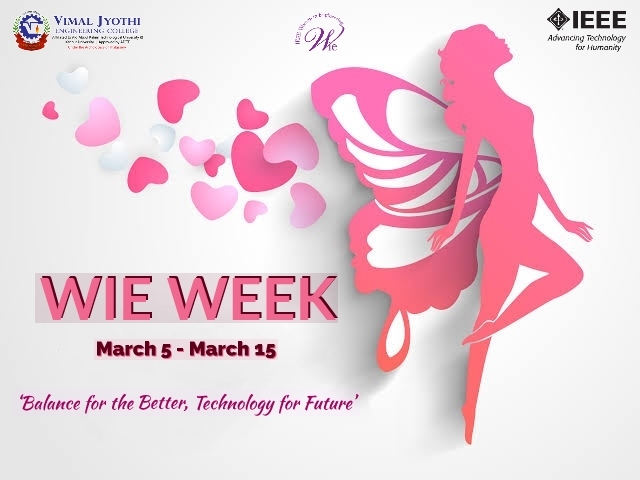 IEEE Women In Engineering (WIE), VJEC Chapter celebrates Women's Day on 8th March 2019. 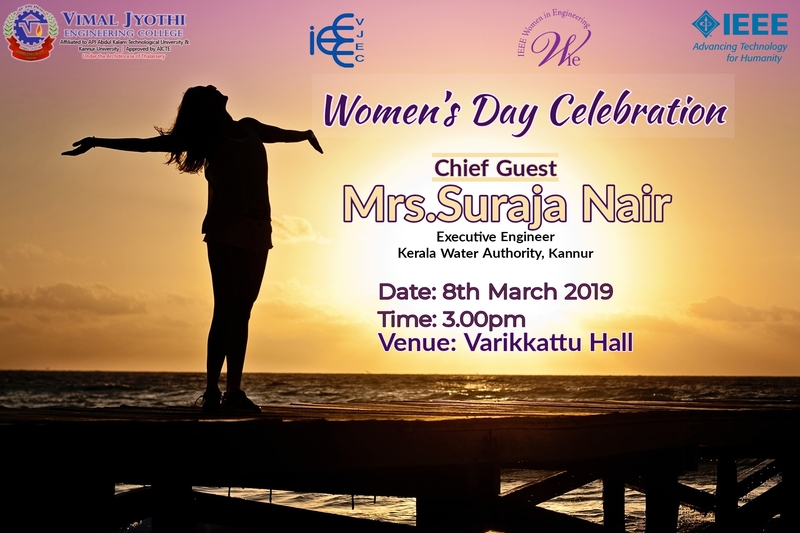 Mrs. Suraja Nair, Executive Engineer, Kerala Water Authority Kannur will be the Chief Guest for the programme. 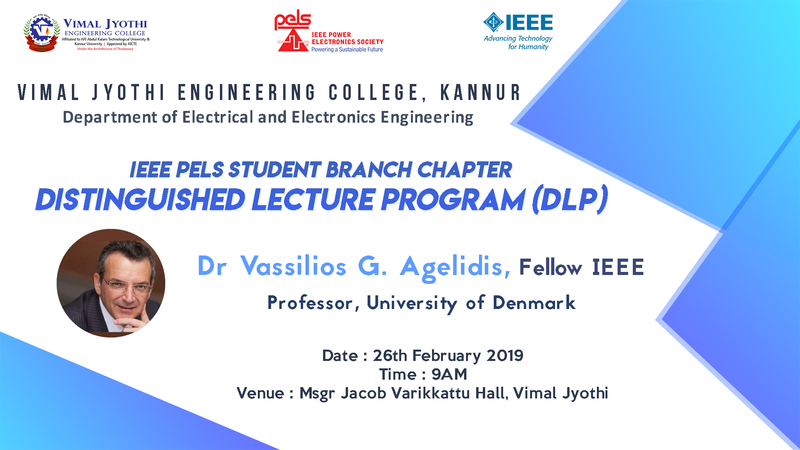 IEEE PELS, VJEC chapter is organising a DISTINGUISHED LECTURER PROGRAMME (DLP) on the topic “Large-Scale Solar PV Electricity Grid Integration: Technologies, Issues, Market Integration and Impact” on 26th February 2019 at Vimal Jyothi Engineering College by Dr. Vassilios G. Agelidis (Professor,Technical university of Denmark ) Fellow IEEE. 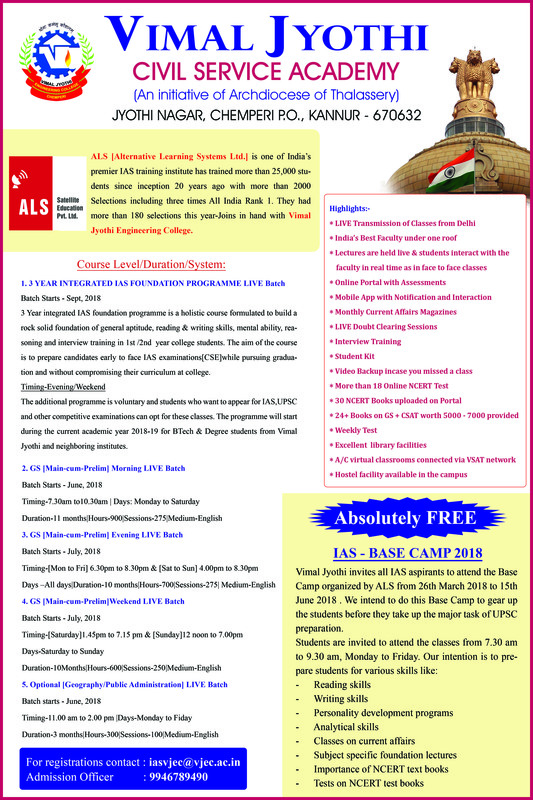 17-Apr-2018|METRON - News Letter For EI Department. METRON - Newsletter of EI Dept. for the month of April 2018. 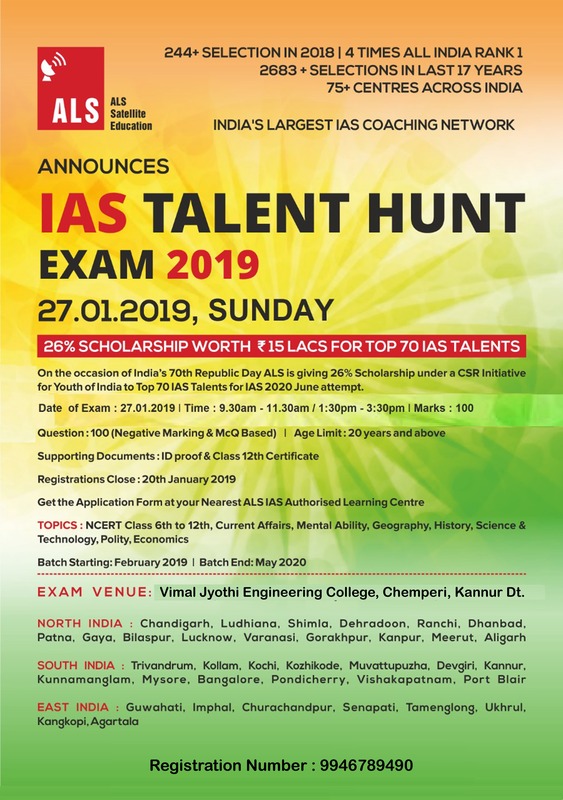 ALS - India's largest IAS coaching network at vimal jyothi. 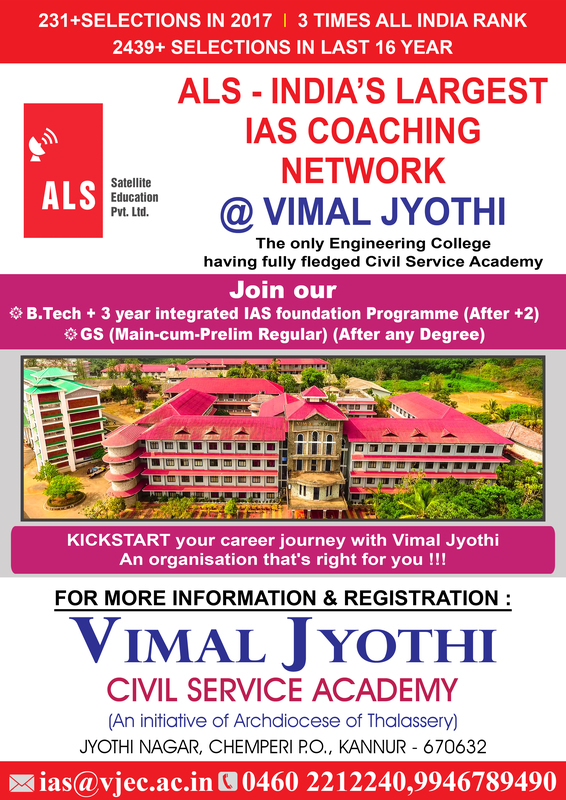 VIMAL JYOTHI CIVIL SERVICE ACADEMY - An initiative of archdiocese of thalassery. 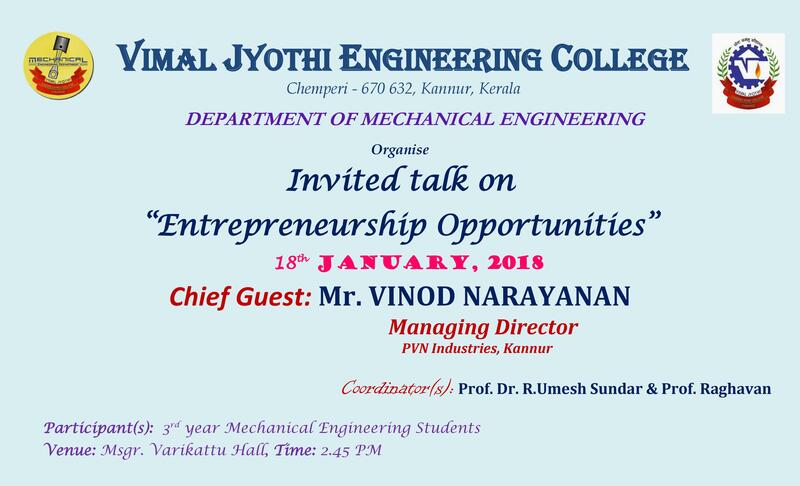 Department of ME organises an invited talk on Entrepreneurship Opportunities on18th Jan 2018. 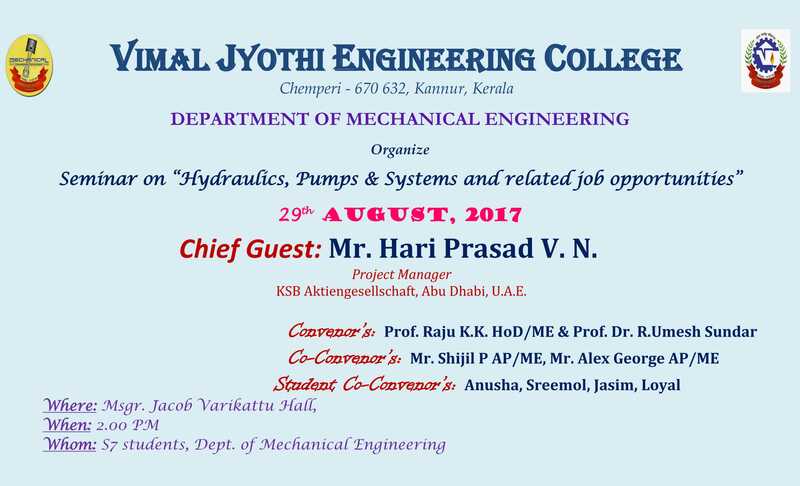 Mr. Vinod Narayanan, MD - PVN Industries Kannur will be the Chief Guest of the program. 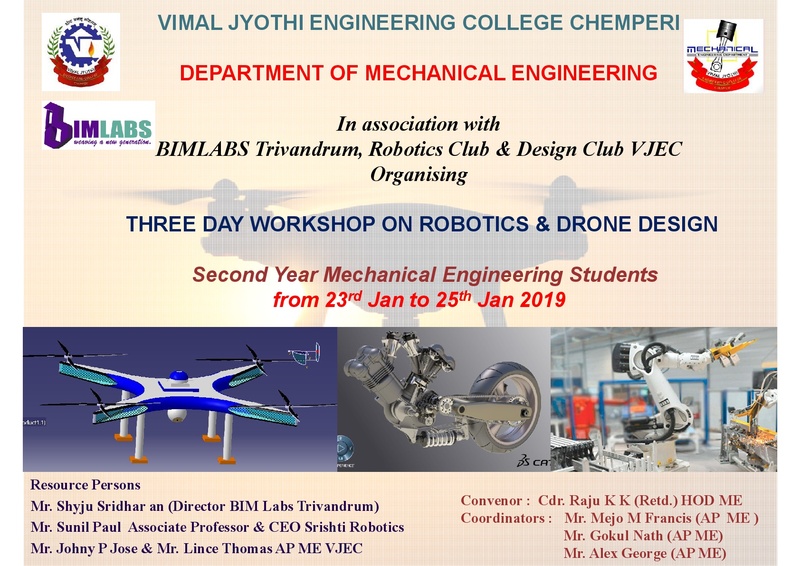 MECHNOVA - Newsletter of ME Dept. for the month of December 2017. 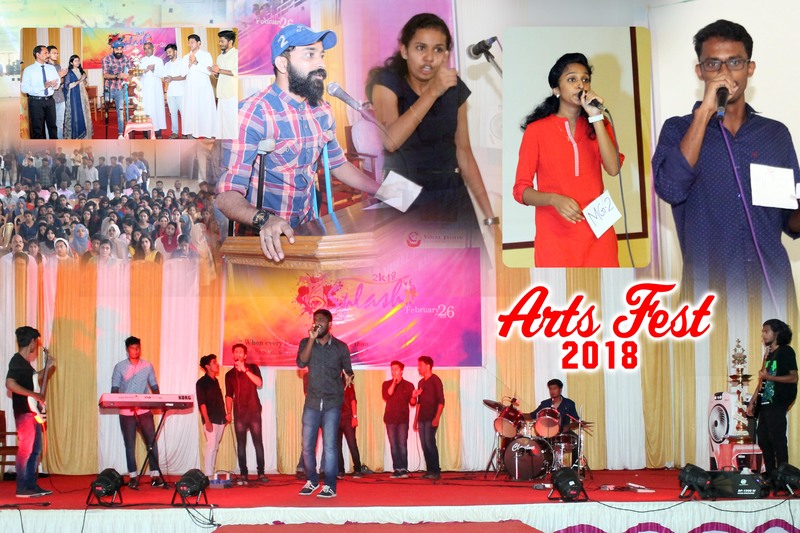 14-Dec-2017|Dept. Of CSE Newsletter Published. 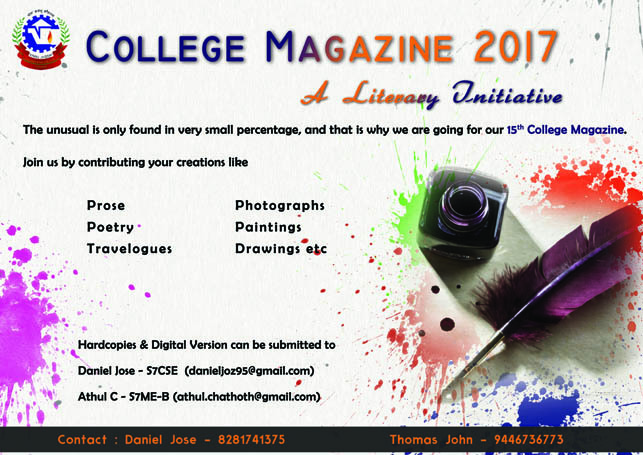 Newsletter of CSE Dept. for the month of December 2017. 13-Dec-2017|NEXUS - Dept. 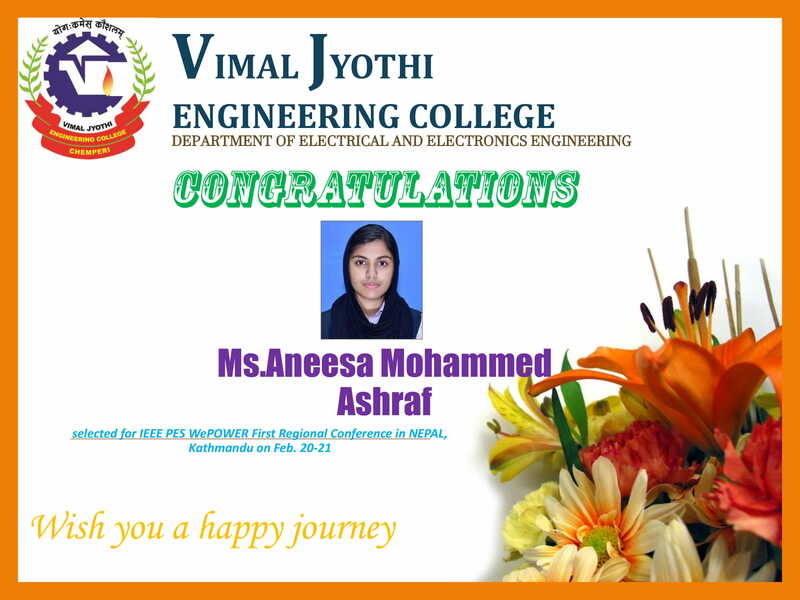 Of ECE Newsletter. 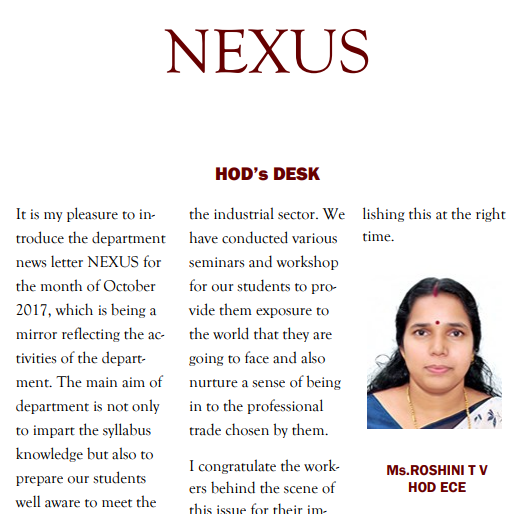 NEXUS - Newsletter of ECE Dept. 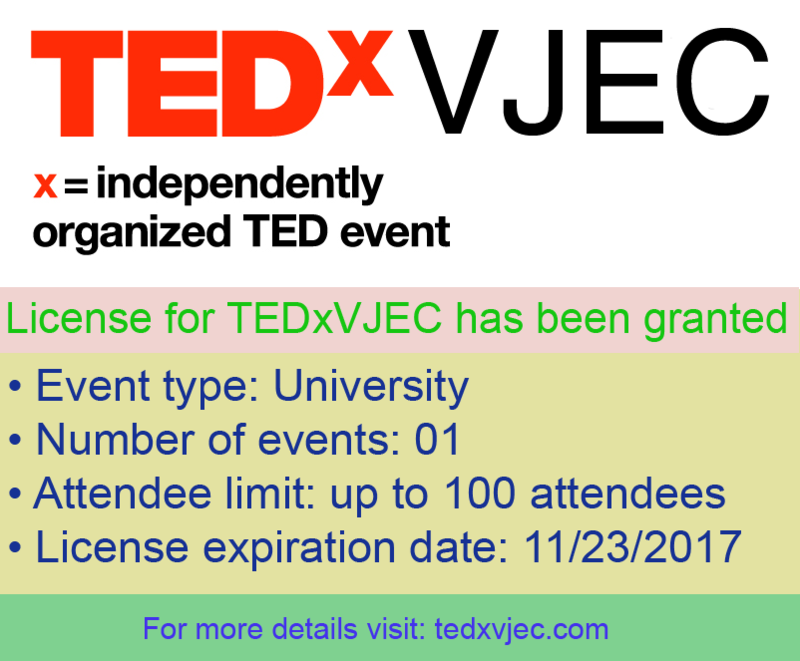 for the month of December 2017. 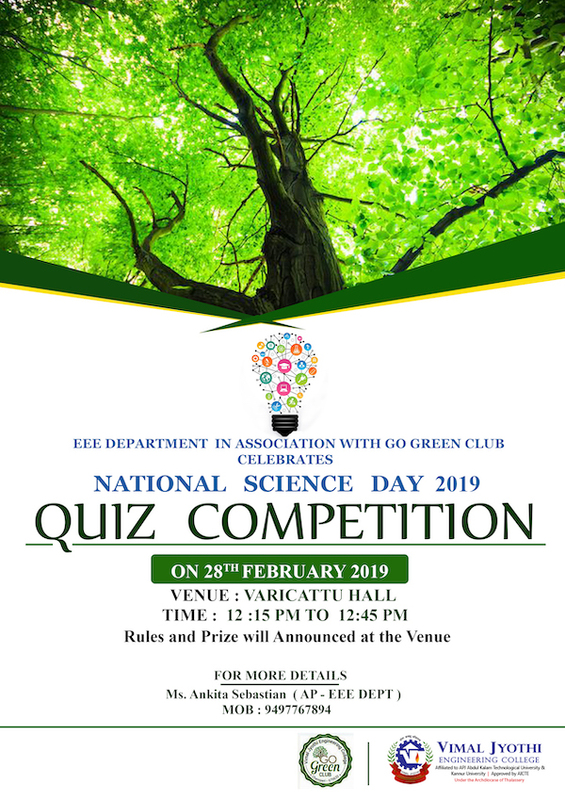 11-Dec-2017|Electrical Gnosys - Newsletter For EEE Dept. 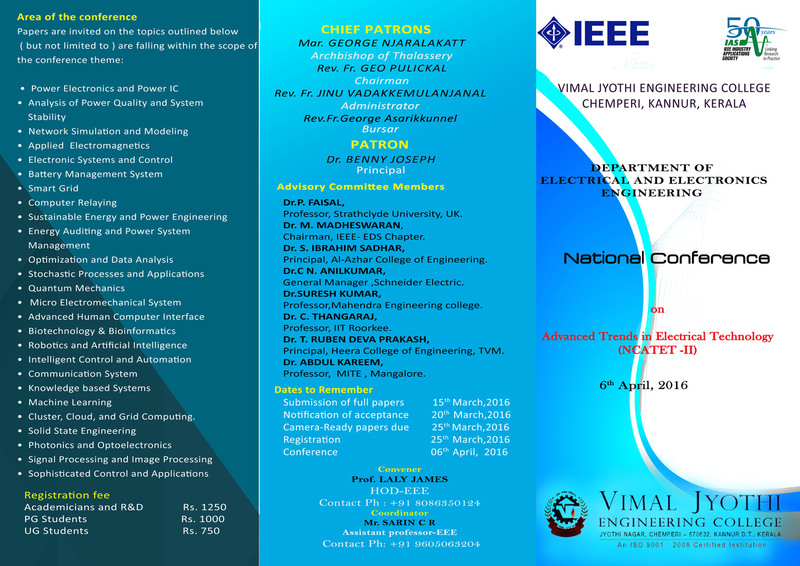 Electrical Gnosys - Newsletter of EEE Dept. for the month of December 2017. 11-Dec-2017|METRON - News Letter For EI Department. METRON - Newsletter of EI Dept. for the month of December 2017. 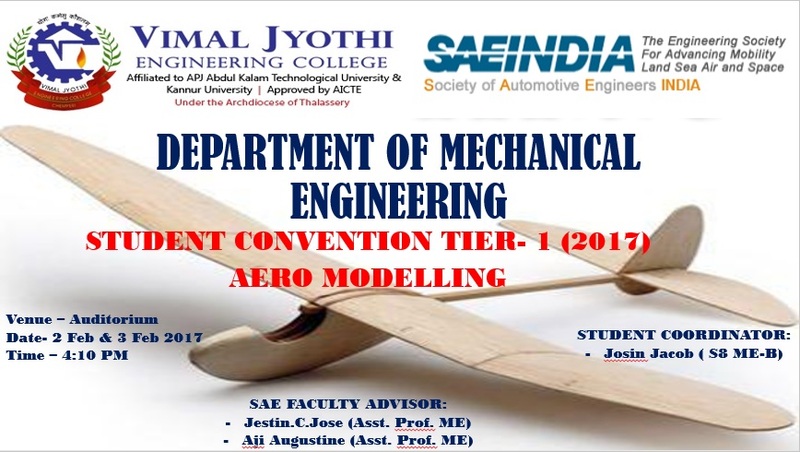 SRISHTI- Dept of civil engineering newsletter published. 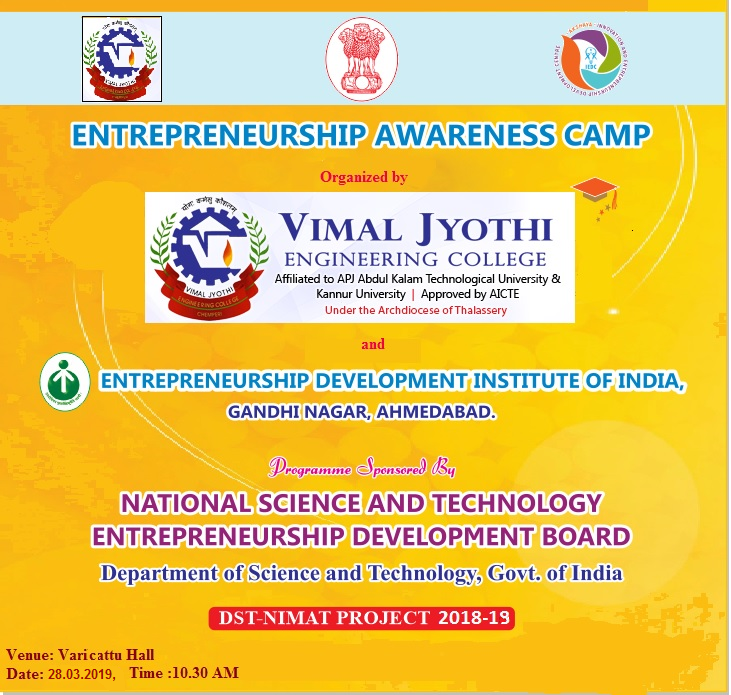 Softonic Innovations, a startup from VJ Inspire, Innovation and Entrepreneurship Development Cell of Vimal Jyothi Engineering College is organising a workshop on Web Development. Introduce the department news letter NEXUS for the month of October 2017, which is being a mirror reflecting the ac- tivities of the depart- ment. 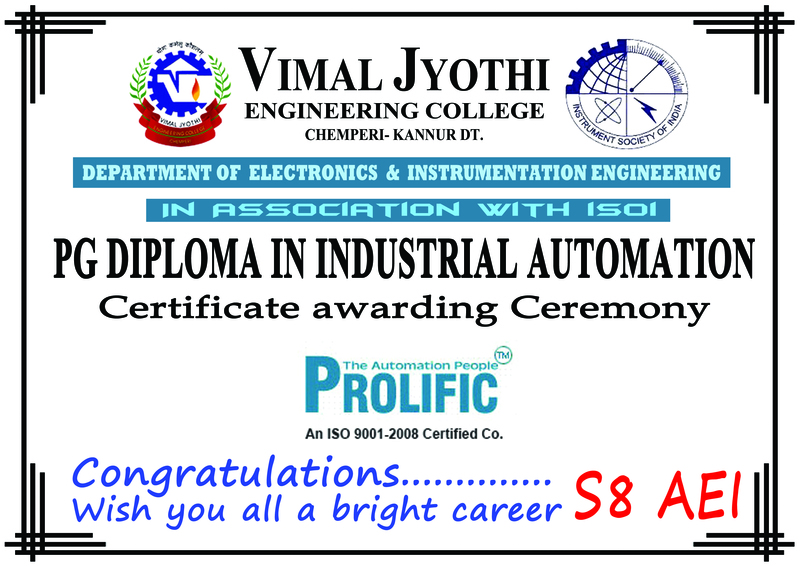 11-Oct-2017|Congratulations To Mr. Avinash S Pramod Of S5 ME A. 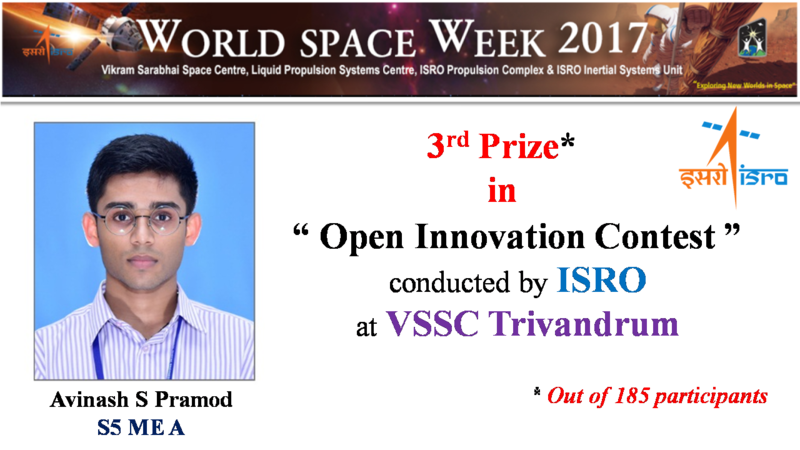 We are really happy to inform you that Mr. Avinash S Pramod of S5 ME A secured 3rd prize in "Open Innovation Contest" conducted by ISRO at VSSC Thiruvananthapuram as a part of World Space Week 2017. 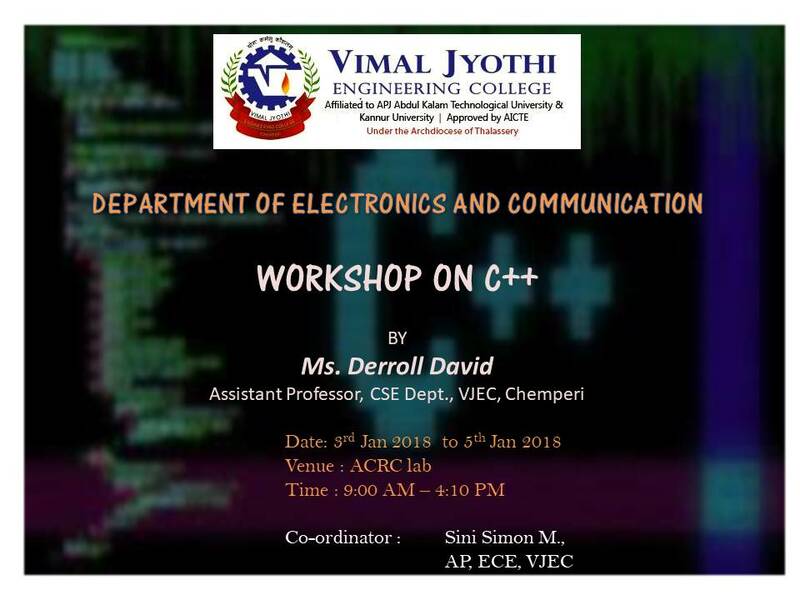 Newsletter- Dept.of computer science and engineering. 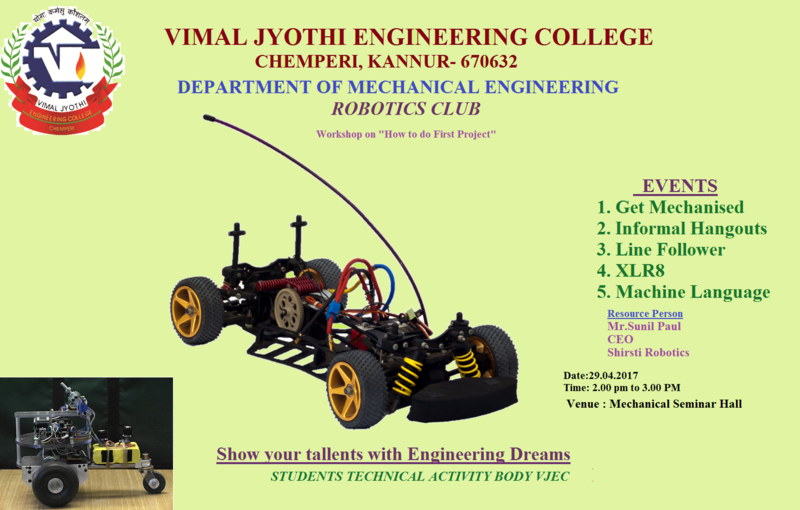 Dept of EEE in association with ASAP, Additional Skill Acquisition Programme, a joint initiative of General Education Department and Higher Education Department, Government Of Kerala under the banner of VJ Inspire - Innovation and Entrepreneurship Development Cell of VJEC, is planning for conducting a free Entrepreneurship Development Program for students of various institutions from Kannur Districts. 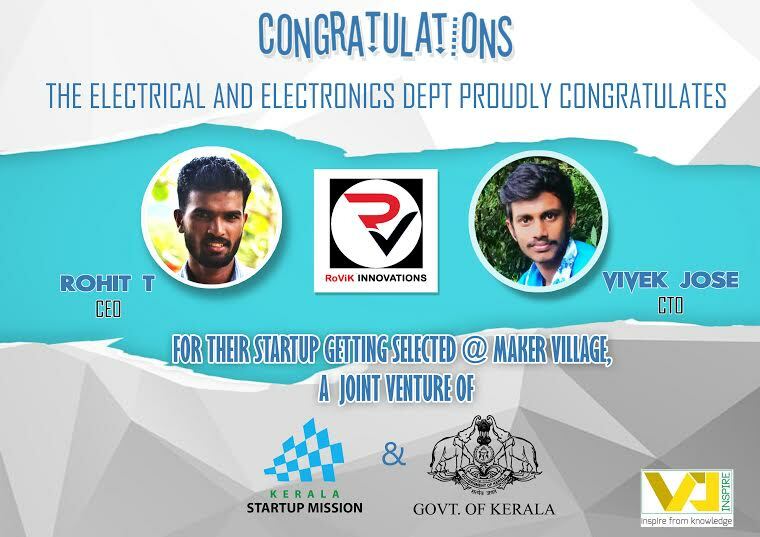 The proposal was submitted by our two startups Unic Innovations & Revenin Automations by S7 EEE Students. 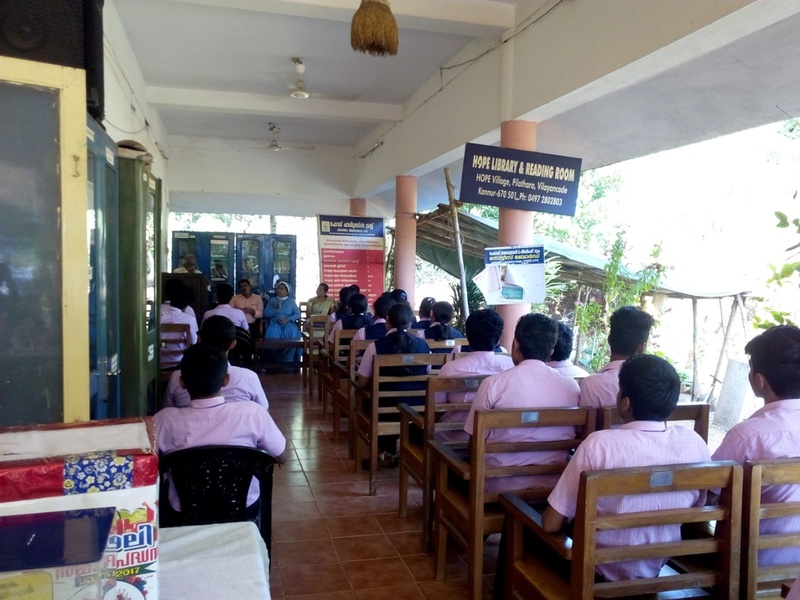 They have organised an awareness session on 24th June 2017 where students from various institutions in Kannur District have attended. 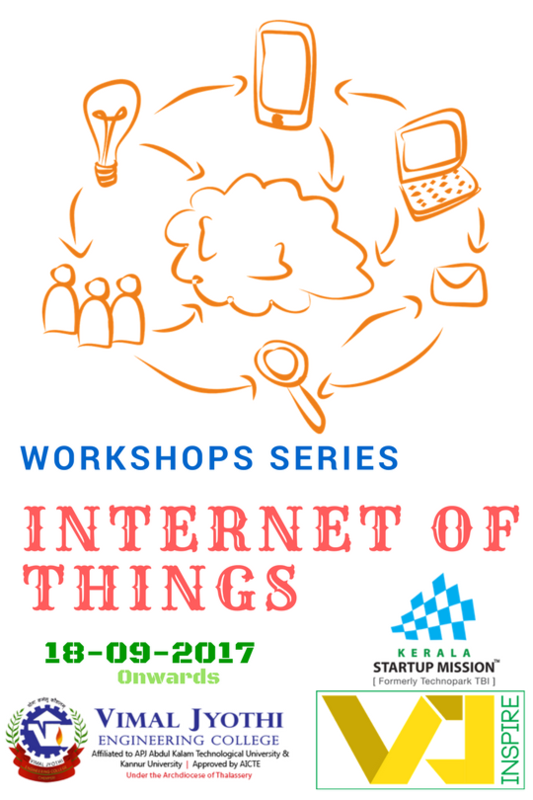 We are planning to organise a workshop on IOT on 30th September and 1st October 2017. 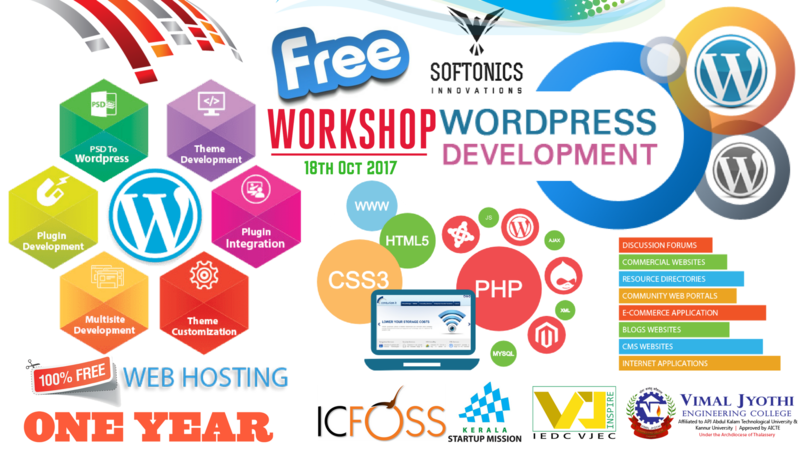 25-Sep-2017|Workshop Series On "Web Development And Internet Of Things "
Department of EEE in association with innovation and Entrepreneurship Development Cell organising a workshop series on "Web Development and Internet of Things ". Revised Time Table for staff published. 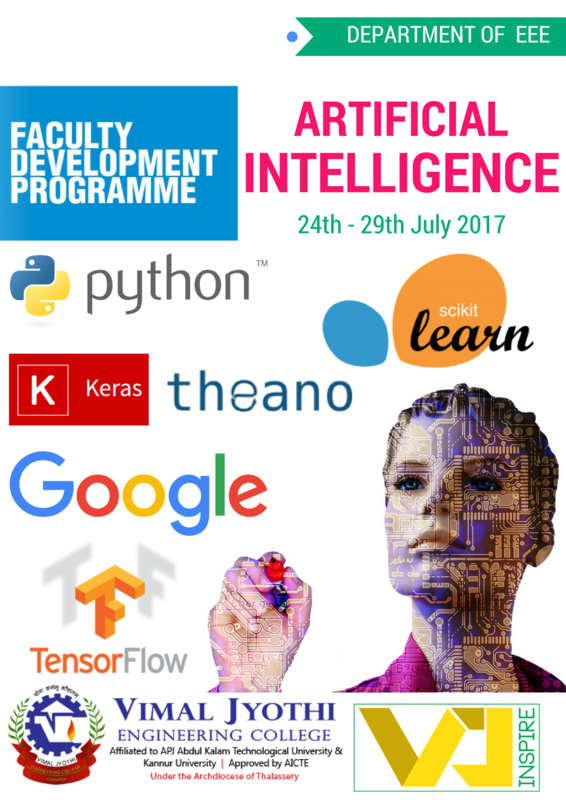 23-Aug-2017|News Letter- Computer Science And Engineering. 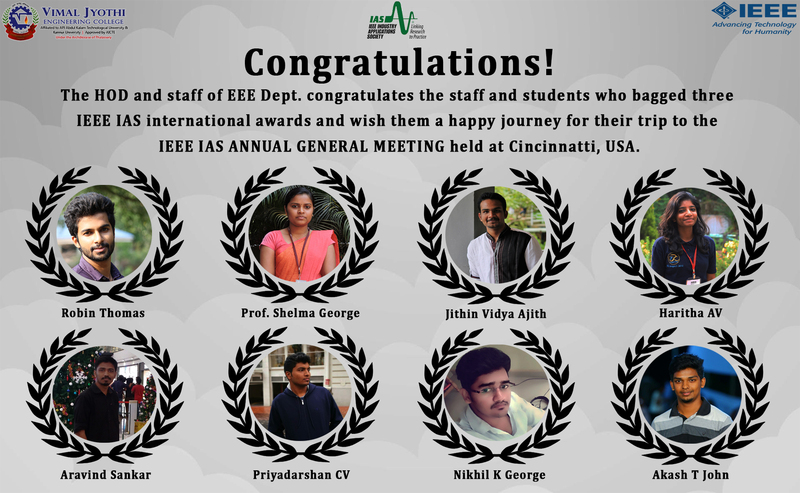 Department of Computer Science and Engineering news letter for the month August. 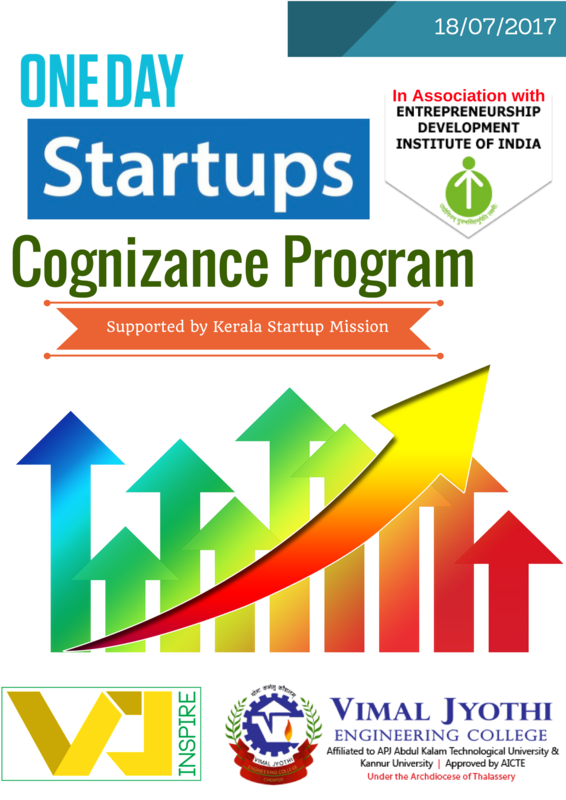 Kerala Start-up Mission in association with Start-up Village is planning to conduct a StartInCollege campaign to aware the students about start up options outside India and to promote student entrepreneurship on 17th August 2017. 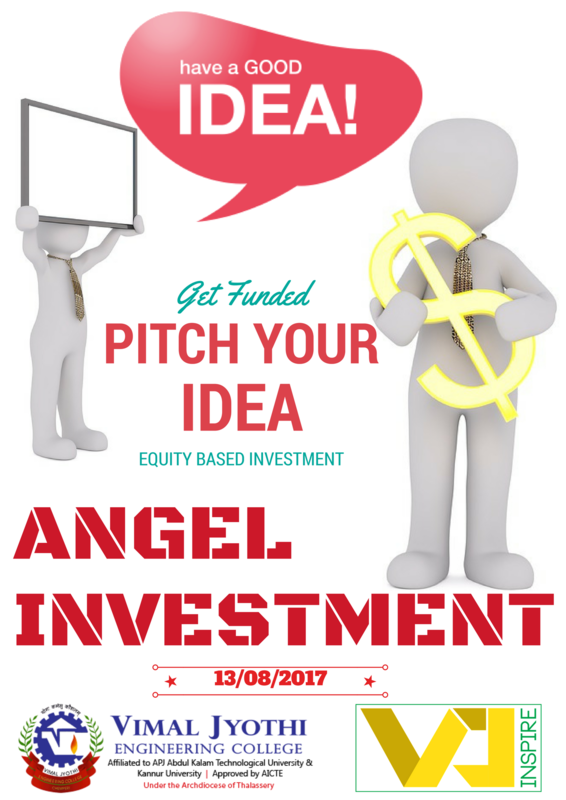 VJ Inspire - Innovation and Entrepreneurship Development Cell of VJEC is planning to organize a One day investment meet , “Pitch Your Idea” on 13th Aug 2017. 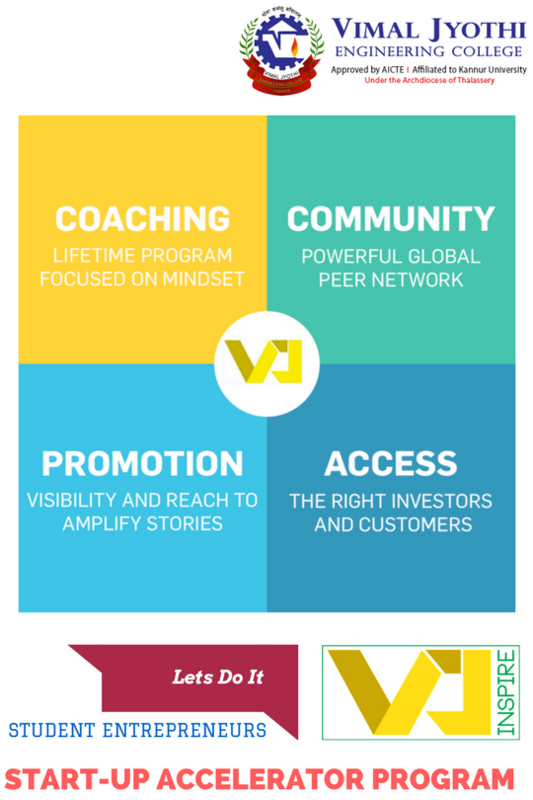 We will provide a platform for investors for interacting with student startups. 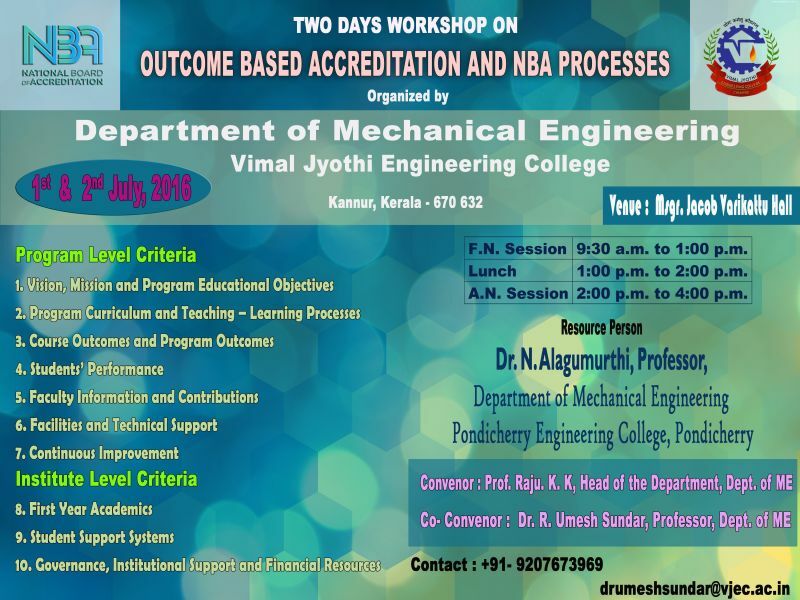 Vimal Jyothi Engineering College is now a member of the United Nations Academic Impact (UNAI). The first Doctoral Committee meeting for the research scholar Mr.Manoj KC under the guidance of Dr.D.Anto Sahaya Dhas, Centre for Research - ECE, VJEC was conducted on 22-05-2017. 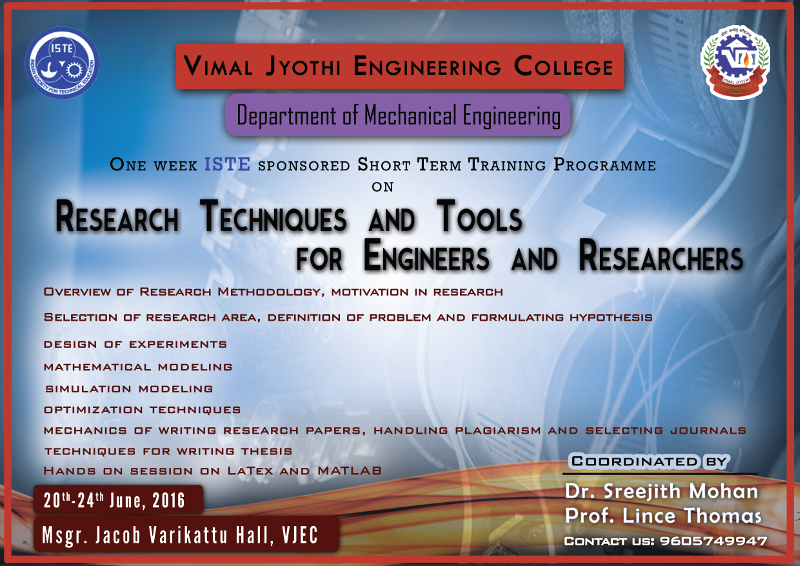 The Dean (Research) of KTU Ms.Vrindha Nair led the meeting. 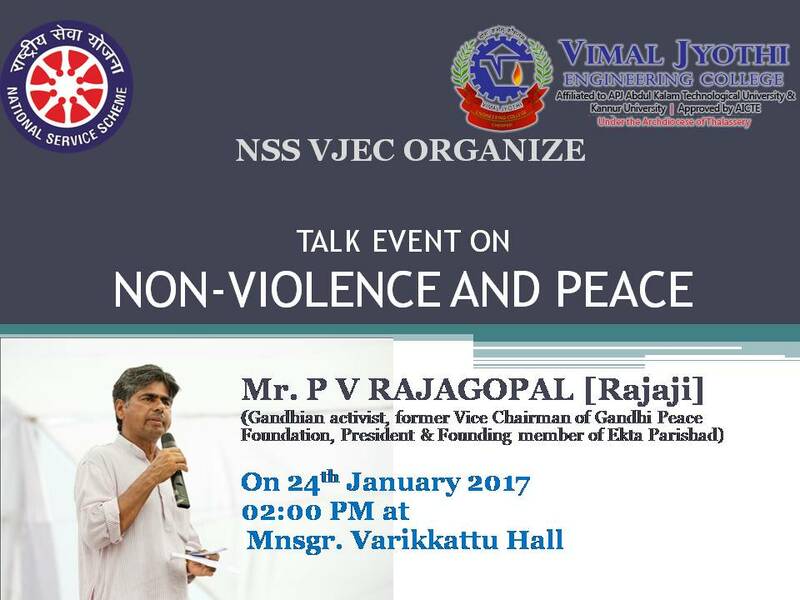 Our Principal Dr.Benny Joseph was the convenor of the meeting. 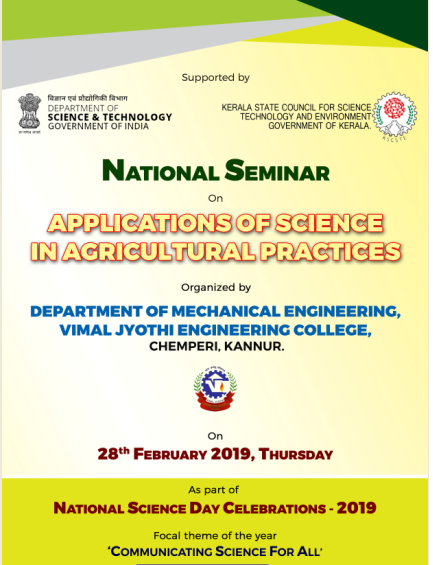 Dr.Perumal Shankar from TocH Engineering College (External Supervisor), Dr.Sreekanth from College of Engineering, Vadakkara (External DC member), Dr.I.Selvamani, Dr.Senthil Kumar of VJEC (Internal DC members) and Ms.Roshini participated in the meeting. 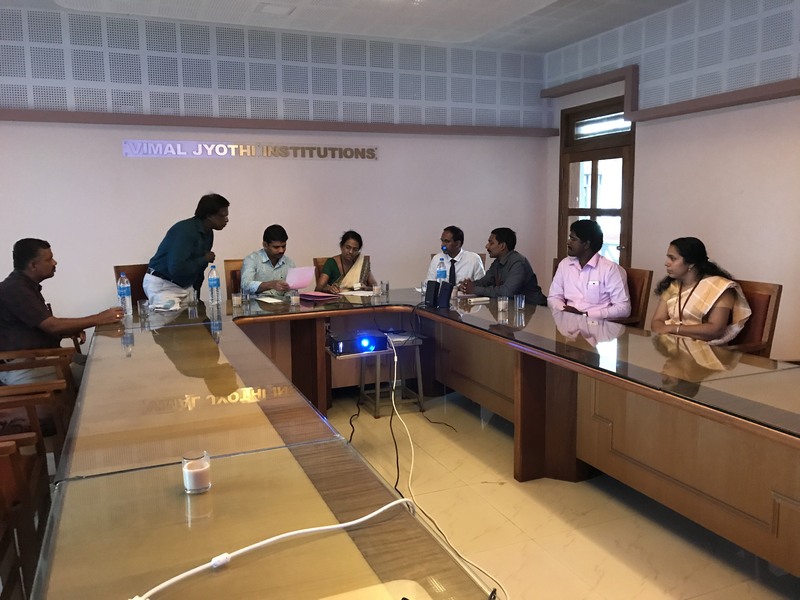 Twenty eight startup ideas from our institution have signed an MOU with Business Incubation Center , Kannur University and Three startups validated their idea. 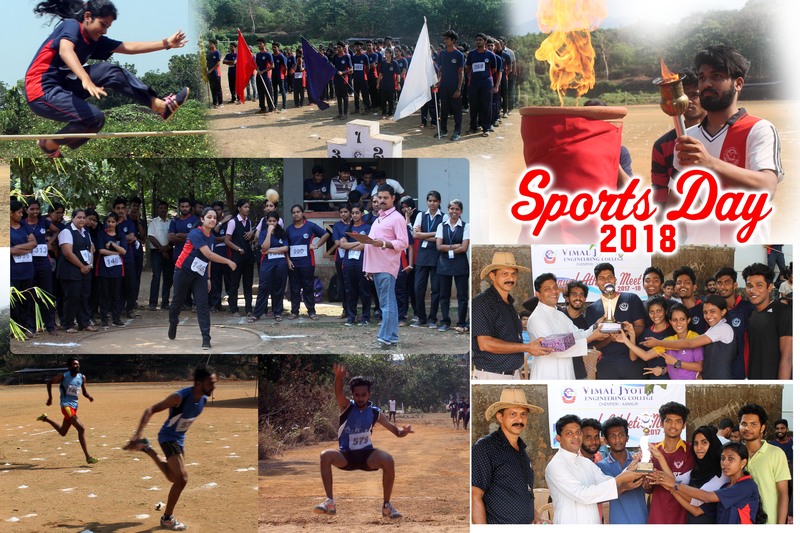 Sixty six students have participated in the event and more than 200 students will be benefited. 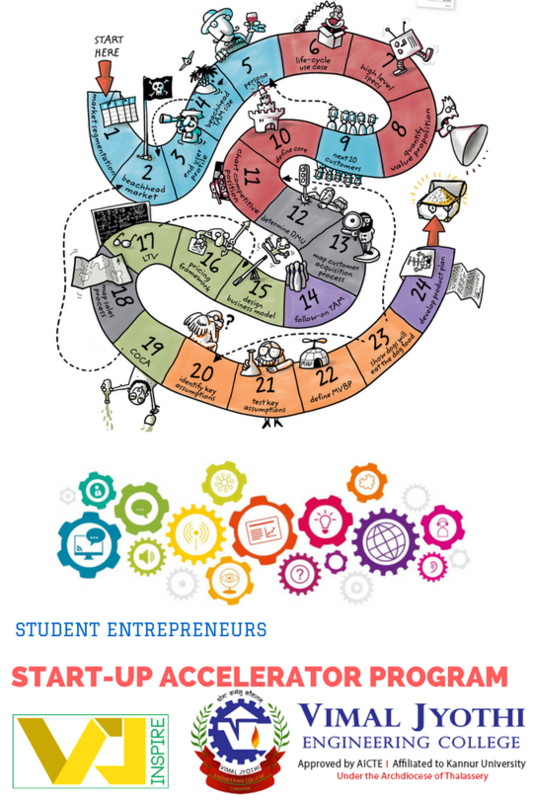 The list of student under these startup ideas will be forwarded to University for the possible options on grace marks upto 4%and additional attendance upto 20% . 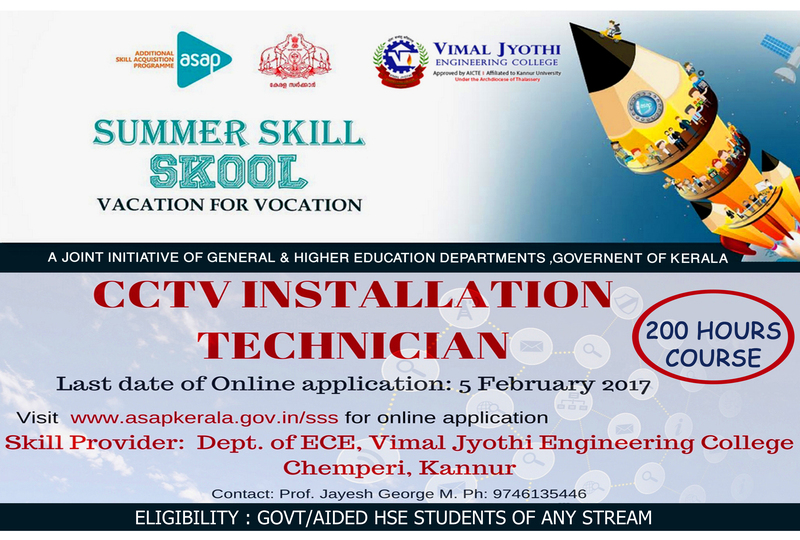 Summer Skill Skool 2017 DAT programme CCTV technician (Skill course batch) was inaugurated by College Chairman Dr. Thomas Melvettoth on 5th April 2017. 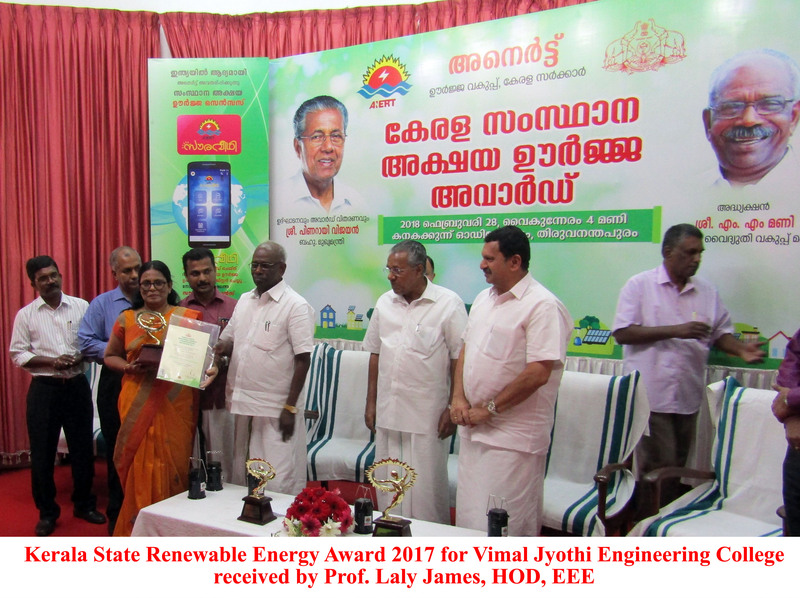 Dignitaries are from left Sijeesh P I, Program Manager,SDC Sreekandapuram, Dr. Benny Joseph, Principal Vjec, Mr. Sebastian Puthanpura, PRO VJEC, Ms. Roshini T V, HoD ECE Dept and ASAP coordinator Mr. Jayesh George M.
VJ Inspire is honored for the Exemplary performance for a period of 2016-17 by Kerala Startup Mission , Govt of Kerala .Best benediction goes to Ms Laly James Convener IEDC, the faculties of Department of EEE ,Chief Mentor Mr. Thejus Joseph and all those persons who helped to achieve this overwhelming performance for the past year.kerala start up mission present the certificate to Vimal Jyothi Engineering College, Kannur for exemplary performance as an innovation and entrepreneurship development centre during 2016-17 academic year. 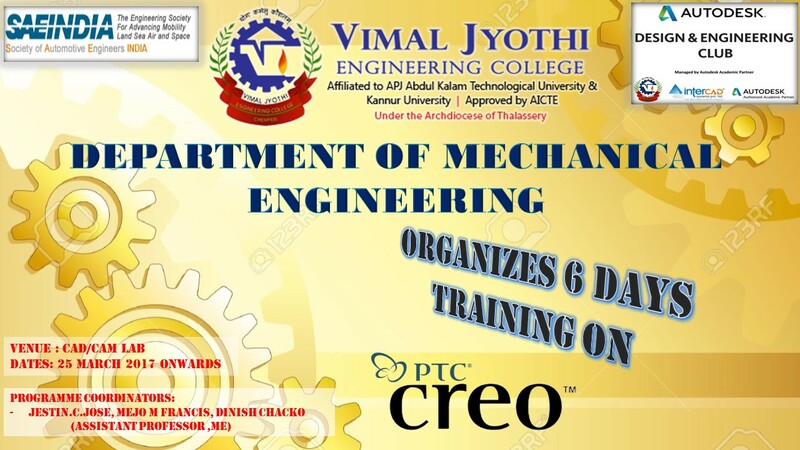 Department of Mechanical Engineering organizes 6 Days Training on PTC Creo Program in CAD/CAM Lab from 25.03.2017 onwards. 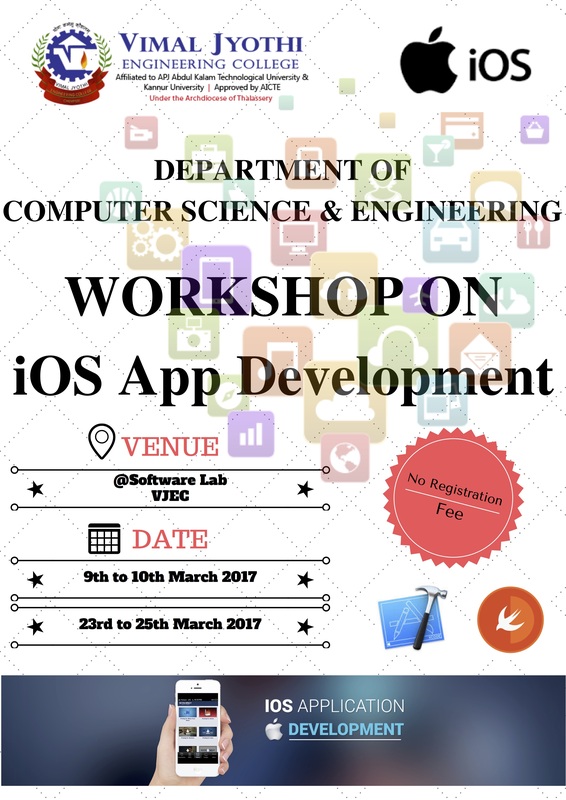 Department of CSE organizes an iOS App Development Program on 9th-10th and 23rd- 25th of March 2017. 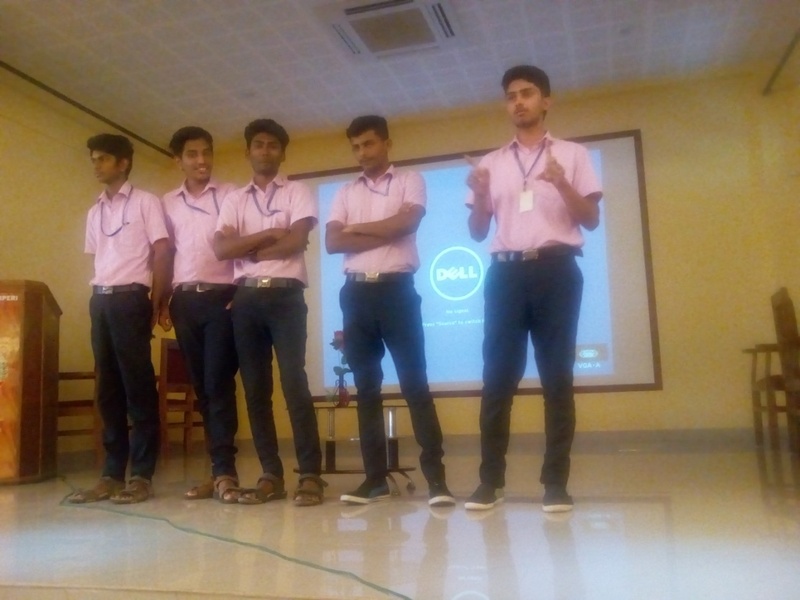 DAY 1 – 8th Feb 2017  Startup presentation (first slot) regarding startup ideas was held at Kannur University on 8th FEB 2017. Students presented their innovative ideas. 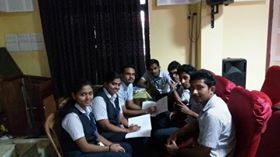 The pros and cons related to different ideas were discussed .It helped the students to know about how to run a firm in future. The ideas selected were decided to award grace marks. 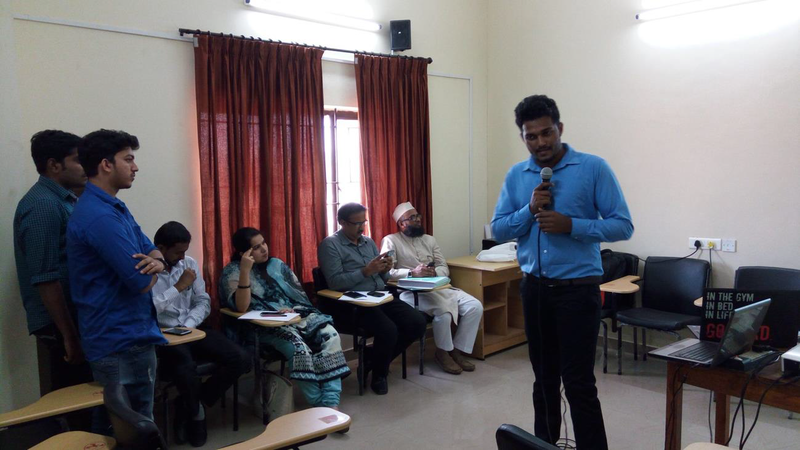 DAY 2 – 7th March 2017  Startup presentation Presentation (second slot) involving various startup ideas was held at Palayad campus on 7th MARCH 2017. 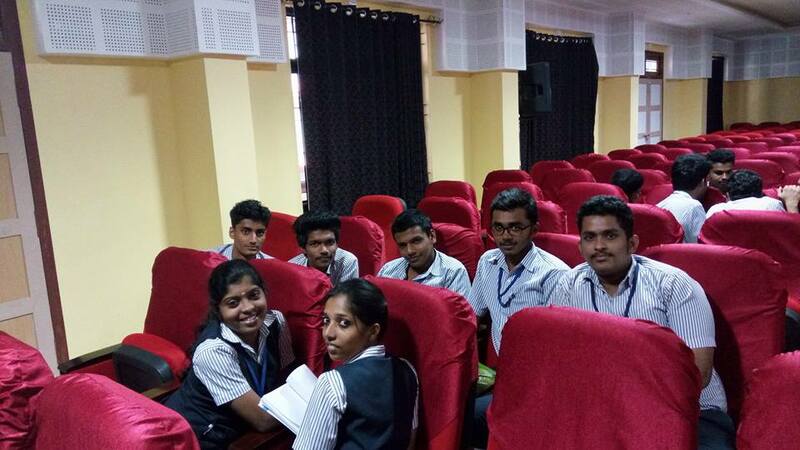 Students presented their innovative ideas there. Ideas not only were related to engineering field but also were linked to our day to day life. The pros and cons related to different ideas were discussed .students were also guided by the mentors for the future developments regarding their concerned ideas. 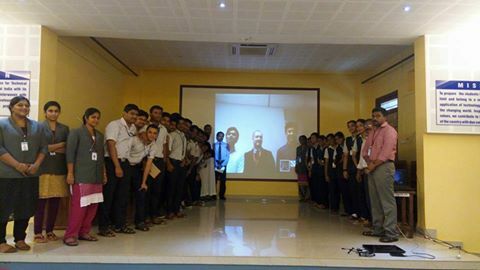 It helped the students to know deep about the ideas and the advancements in future. Over 20 groups shared their startup ideas. 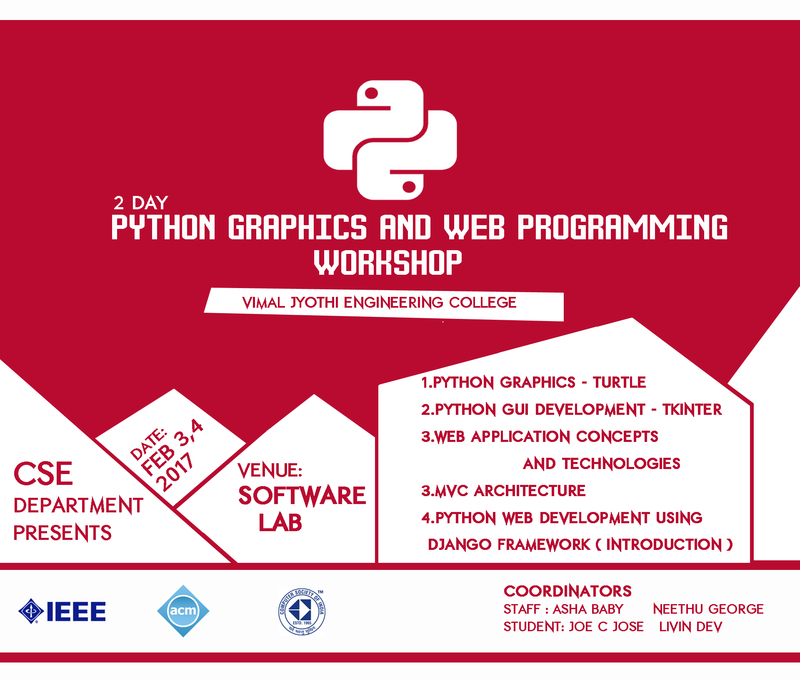 On 31/1/2017 a workshop was conducted on Web-designing for the first and second year students of Electrical and Electronics Engineering department. 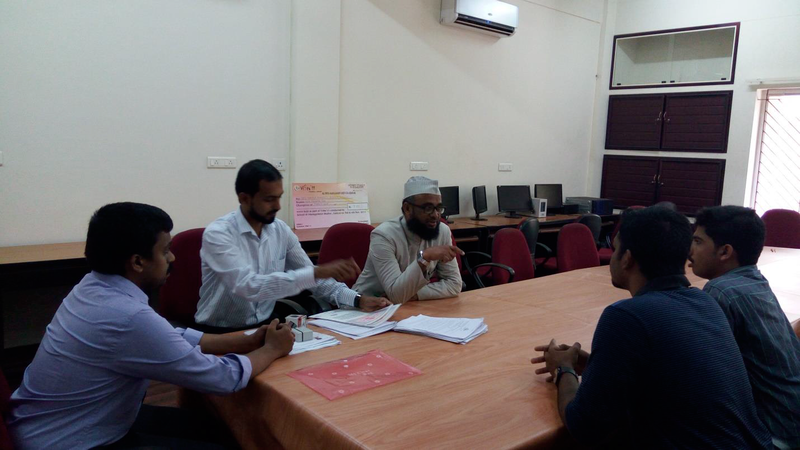 The workshop was lead by Mr. Sarin C R (Assistant Professor, EEE department). 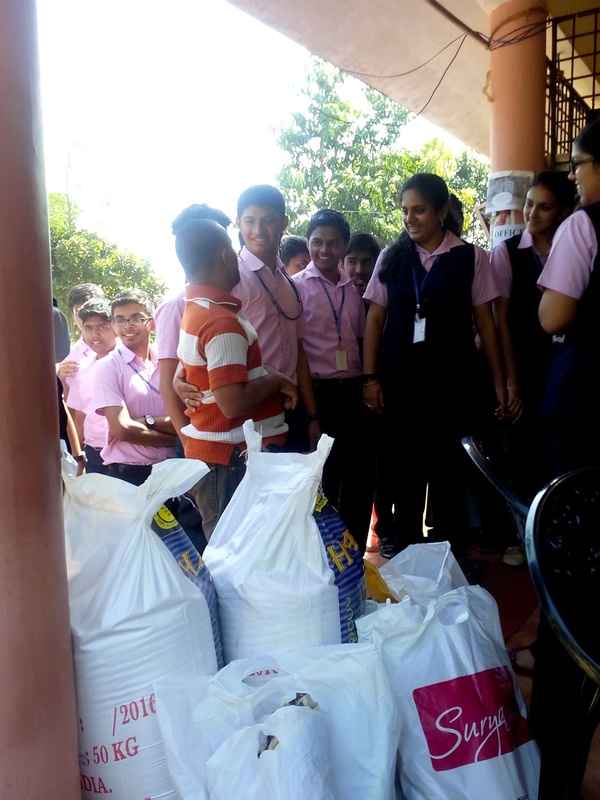 He was assisted by some of the senior students of EEE Department. 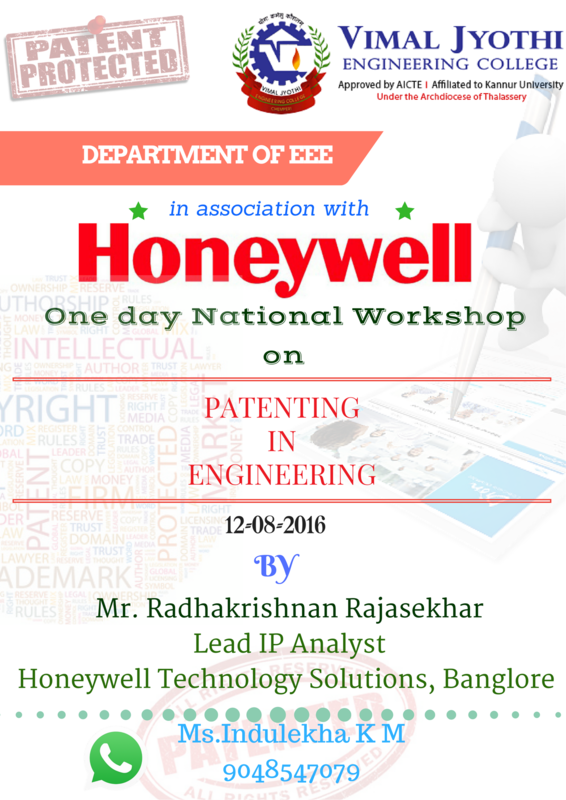 The workshop was scheduled from 9am to 4pm. Almost 30 students attended the workshop. In the beginning, an introduction about web-designing and its importance in the upcoming centuries. 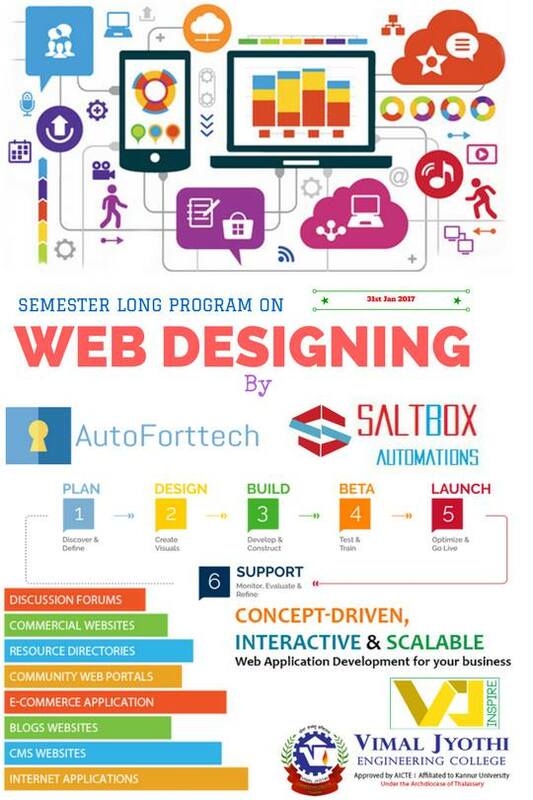 Web design encompasses many different skills and disciplines in the production and maintenance of websites. Website design also involves information architecture, website structure, user interface, navigation ergonomics, website layout, colours, contrasts, fonts and imagery (photography) as well as icons design. All these website elements combined together form websites. After the introductory session each one of were given a system. Then started to design website of thier own interest for a start-up of our own idea. Various instructions to design the website were given. Senior students were also really supportive. They gave various instructions on how to design a website more effectively and in a very attractive manner. In the afternoon session, all were asked to design a website without any assistance from others. It was really challenging. Each one of them did it with full dedication. Everyone tried their maximum to make their website design the best. 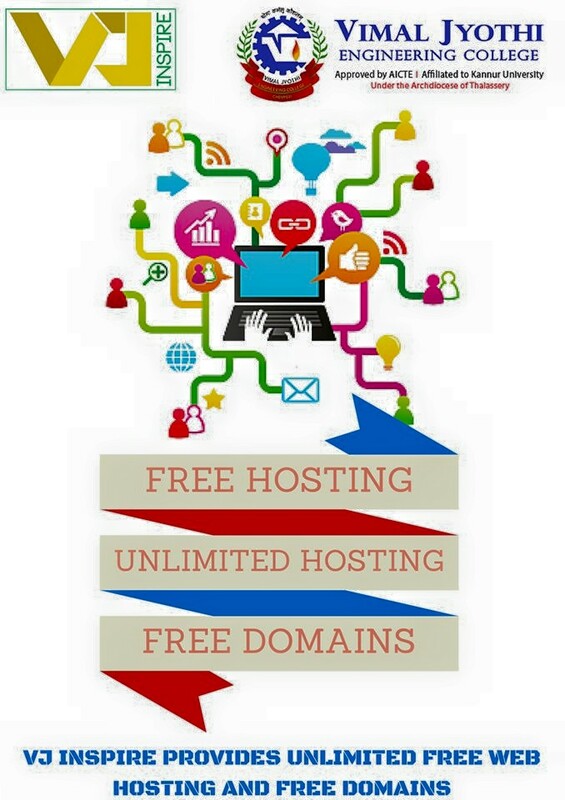 Then explained the various terms such as domain, hosting and how to access this etc. In the end all the students who attended the workshop had a better idea on how to what actually Web-designing is and how to create a website. The session was really helpful and also creative and innovative. SWEN AUTOMATIONS from Muhammded Faisal, Ashin KK, Arun KV, received an amount of Rs 5000/- as initial seed amount of Seed fund competition INNOVATION AND ENTREPRENEURSHIP DEVELOPMENT CELL (IEDC). As a part of MOOC course scheme under Innovation and Entrepreneurship Development Cell of our college , We have a funding plan for for students doing on-line courses . 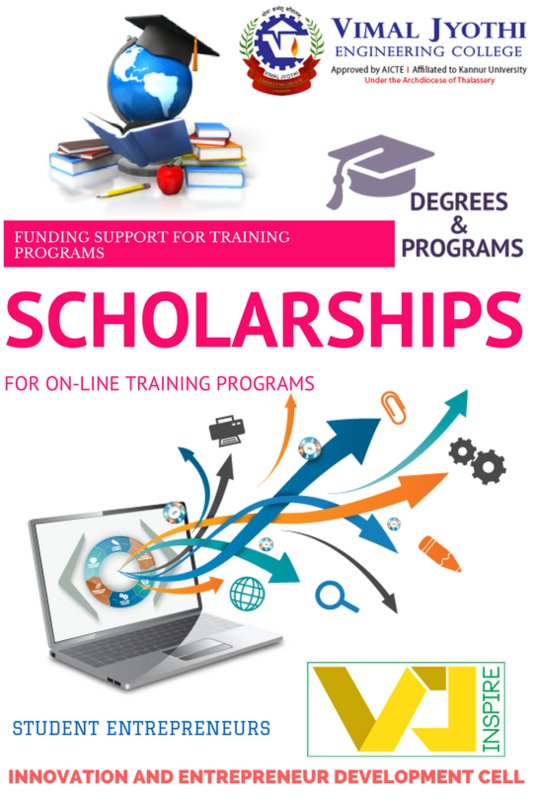 Students who have successfully completed MOOC courses will be given a course fee scholarship. Criteria for getting scholarship 1. Students should have to set up a assignment report on the topic. 2. 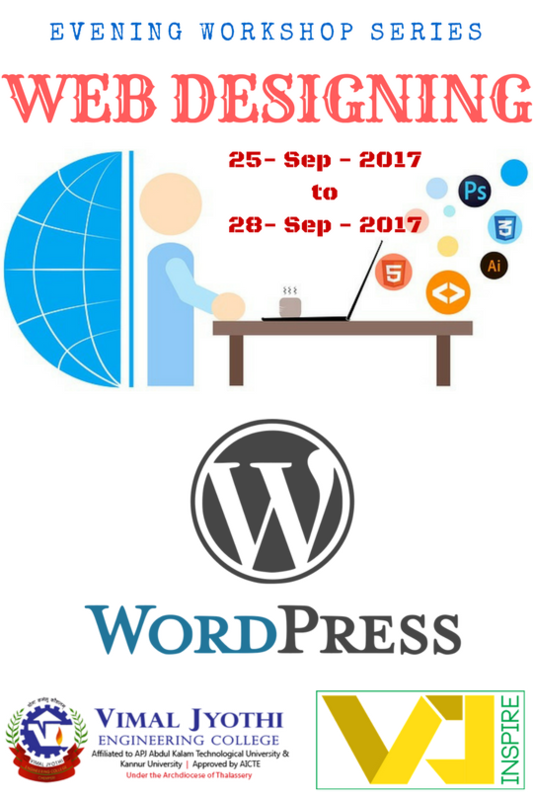 Students should take classes of reputed sites such as Coursera, Edex , Udeacity, Udemy etc. 4. Students should take classes of at-least 30Hrs. 3. Students need to get a pre- approval of course syllabus from the Head of the Department. Area of specializations applicable : App Development, Machine Learning,Web Development, PHP, IOT, Anrdoid Studio , Artificial Intelligence, Robotics. 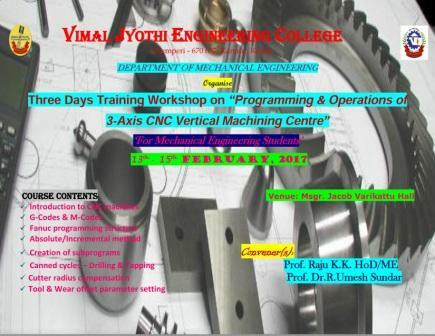 An introductory session on Matlab 2016b was taken by Mr.Manisankar on 16 and 17th of January at Vimal Jyothi Engineering College, oraganised by Electrical Department to provide demonstration to M-tech students and staffs of Electrical and Electronics Engineering. MATLAB (matrix laboratory) is a multi-paradigm numerical computing environment and fourth-generation programming language. A proprietary programming language developed by MathWorks, MATLAB allows matrix manipulations, plotting of functions and data, implementation of algorithms, creation of user interfaces, and interfacing with programs written in other languages, including C, C , Java, Fortran and Python. 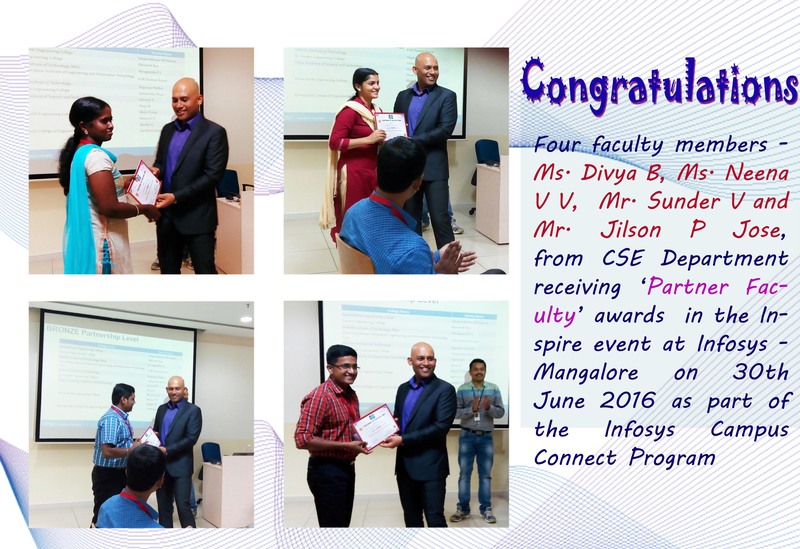 The session helped both students and staffs to know more Matlab 2016b. He also gave an overall view about the various tools of the Matlab 2016b and the use of each tool in various applications. The session was very interactive as he discussed about the already existing tools in the Matlab and the newly available helping windows. 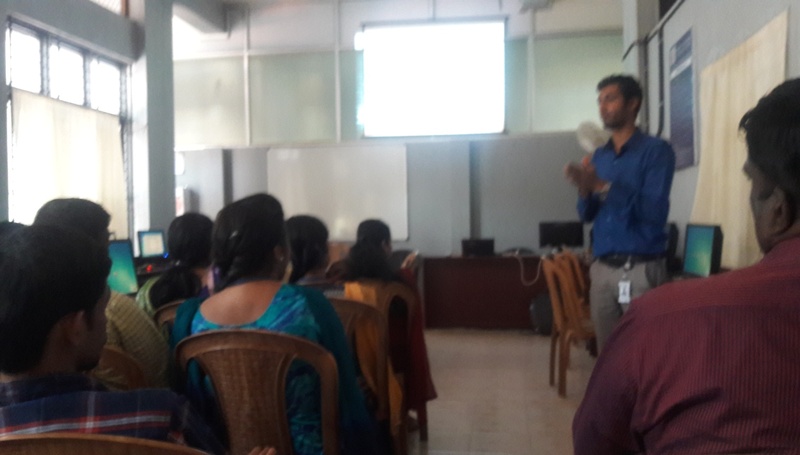 On 17-12-2016, a one day workshop was conducted on entrepreneurship development for first and second year students by Mr. Sarin C R(Assistant professor of EEE department). The class was held from 9AM to 4:00PM.The class was divided into two sections. Morning and evening section. 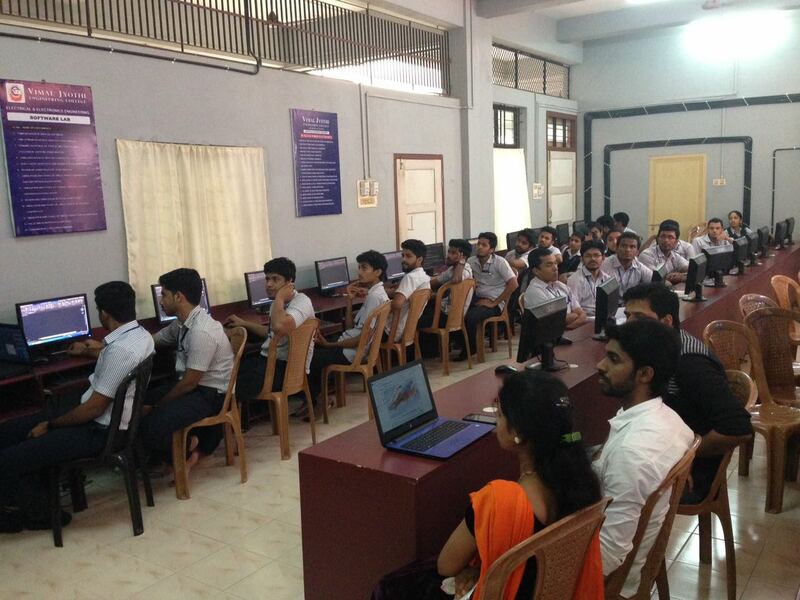 Nearly 60 students attended the workshop. Morning section sir showed us about the change in technologies in the world within a very few years. 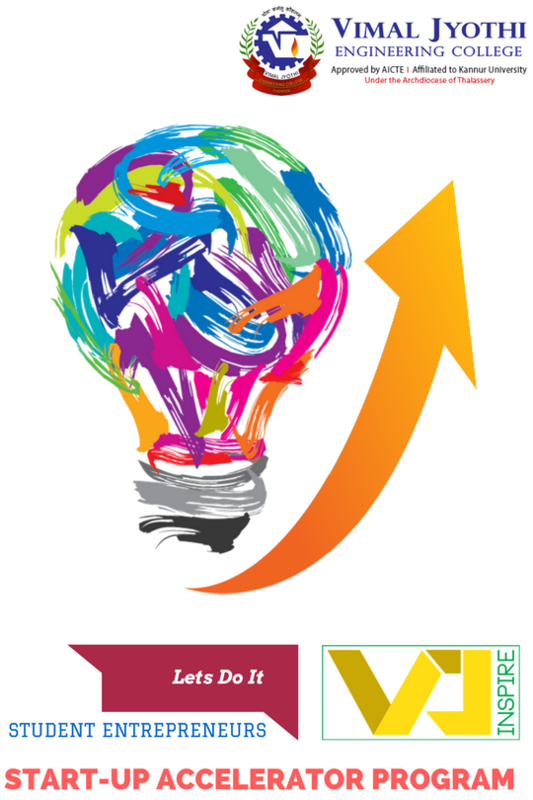 New idea, new innovations and new creations. Sir explained to about changing trends in jobs and the jobs that are disappearing from the world nowadays. Some of the jobs which were very common in our society before five or ten years has been now completely disappeared from our society. Also many more such jobs are still to be disappeared .This change can be good or bad...it depends. When one opportunity is lost millions of other opportunities are created. From the presentation that showed us we came to know some of the recent technologies that the world accepted. Before the morning session comes to an end we were divided in to different groups with five members each and we were made think of a new start up idea and its scope and relevance in this world. In the afternoon section it was time to present that idea that each group discussed, before everyone. After the presentation of idea by each group the other group members have chance to ask doubts about that project and also they can add their suggestions to it .Actually it was a platform to discuss about new ideas that comes to our mind. Many new ideas were put forward by each group and also sir added his suggestions and methods to improve the projects. 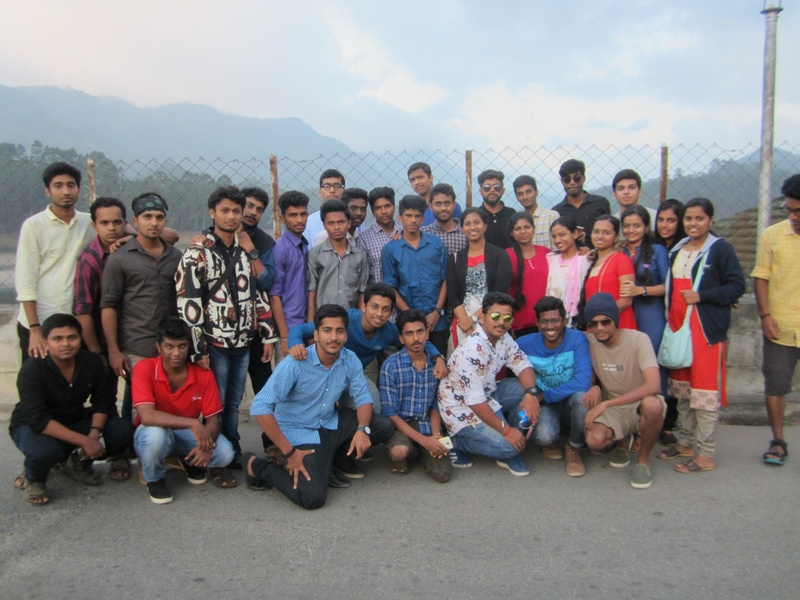 First year Students of EEE department (2016-20 Batch) went to an industrial visit to Barapole Hydro Electric Power station on 16-12-2016 with their tutors Ms. Tintu George and Mr. Jithin K jose . The team reached there by 11.00 am. Two officials received the entire team at the fore bay and gave a brief introduction about the power plant. After that they guided the students to the water diverting area. 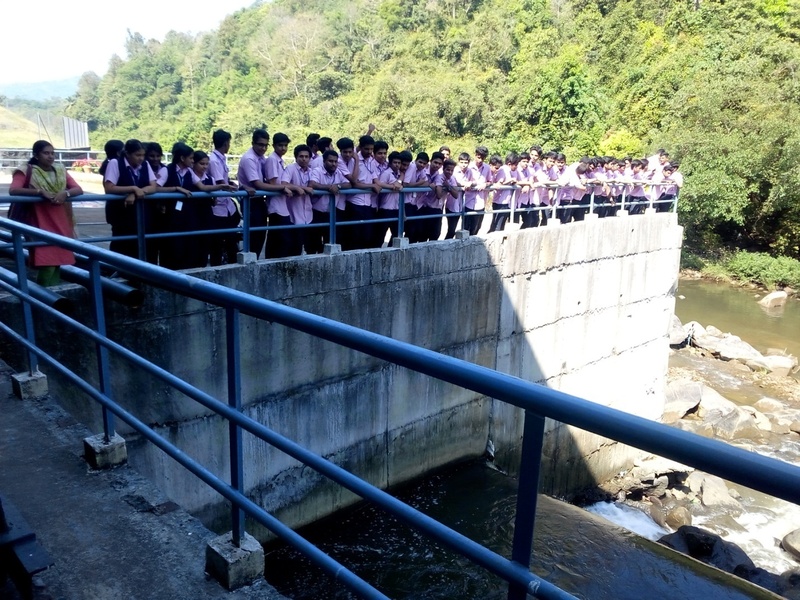 The officials taught in detail about the power plant from Catchment area to the power house section. 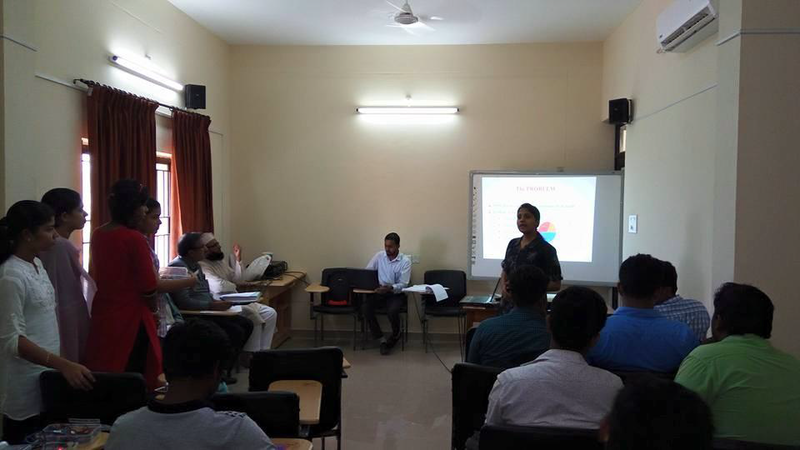 PURPOSE To understand the students about hydroelectric power generation concepts, solar power generation concepts, types of turbines used in generating plant, basic electrical equipments for generation and transmission etc. NAME OF INDUSTRY VISITED Barapole Small Hydro Electric Power plant INDUSTRIAL ACTIVITIES Barapole is a hydroelectric power plant which generates 15MW electricity with 3 machines producing 5MW each.They are not making use of any dam instead they are making use of run off river water.2 canals have been constructed at the bottom of the river for this purpose.Frenchwere technology is being used here and this is the first hydroelectic power plant in India to make use of this technology.The turbine used here is Horizontal Francis turbine.Out of the three turbines medium head turbine is being used here. 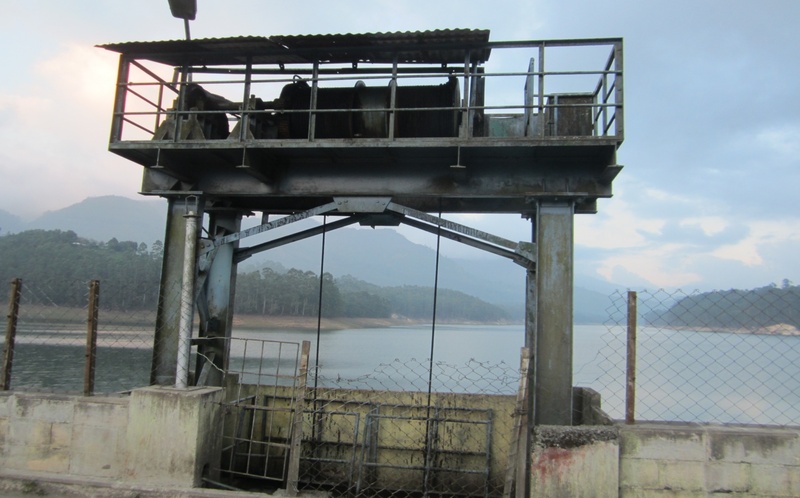 The transformer used here contains breather (which removes moisture content).The diameter of the penstock used is 2.12m.11KV is the generation voltage and 33KV is the transmission voltage.11/33 KV transformer is used here.The canal is 3km away from the generation site.The water flows from canal to tank(75 lakh litre capacity)and then to penstock. The water first flows through bypass or butterfly valve,this then flows through MIV(Main Inlet Valve).Then the pressure will be equalised on both side.Then watet flows through with 10% opening.480rpm excitation and then the 11KV electricity is generated.Then the students where taken to the site where solar panels are present.4MW electricity is being generated with 3MW at the canal top and 1MW at the emd LOCATION It is about 22km away from Iritty. The Barapole SHEP is implemented as a run off the river scheme in the Barapole River, one tributaries of Valapatanam River located in Ayyankunnu Panchayat of Iritty Taluk, Kannur district of Kerala State. 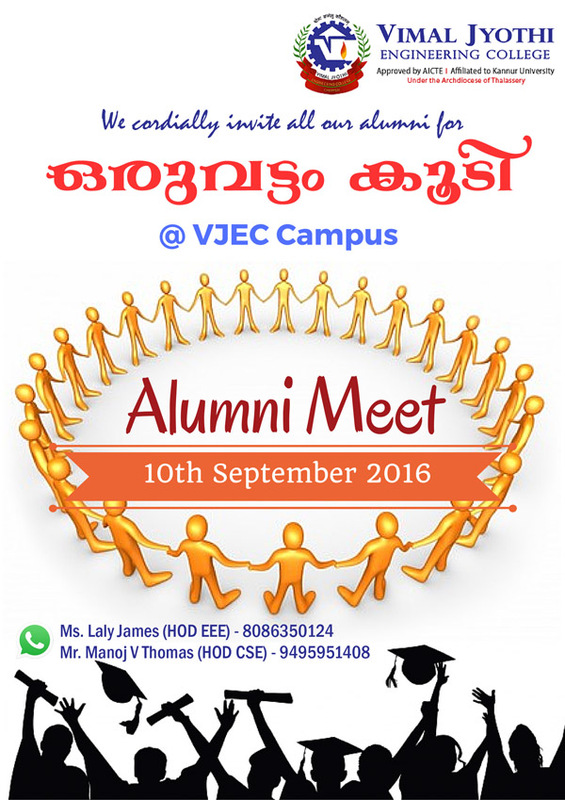 Computer Science & Engg News Letter - " Oruvattam Koodi " October 2016 has been published. 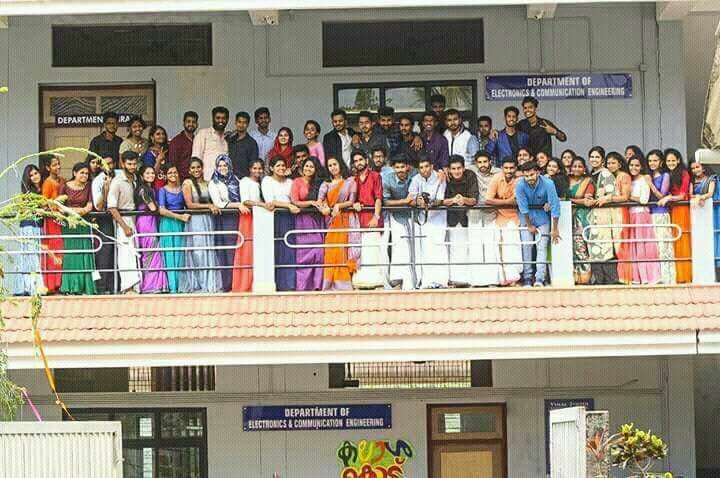 Department of Electrical & Electronics Engg. 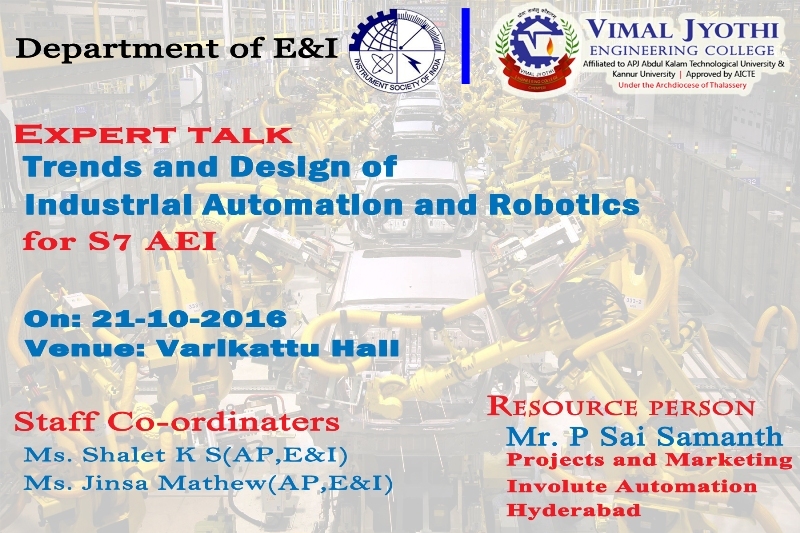 has been issued a Newsletter on October 2016 including snapshot of the various activities and advancements of EEE department in the last two months. 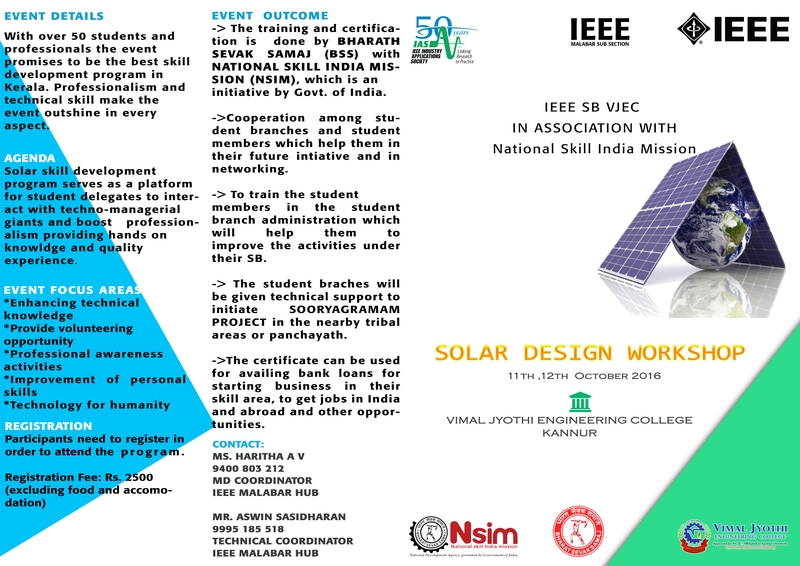 11-Oct-2016|Two Day Workshop On Solar Design - " Sooryagramam"
BonVoyage - VJEC IEEE IAS Students have secured 3 International Awards and will travel to United States. 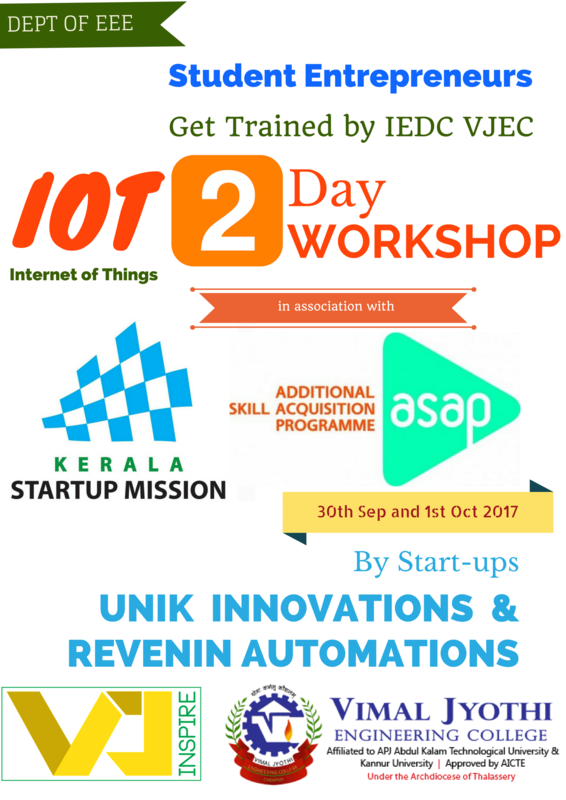 Department of E&I, in collaboration with ISA and ISOI, is conducting a One Day Workshop on Visual Programming in Arduino. 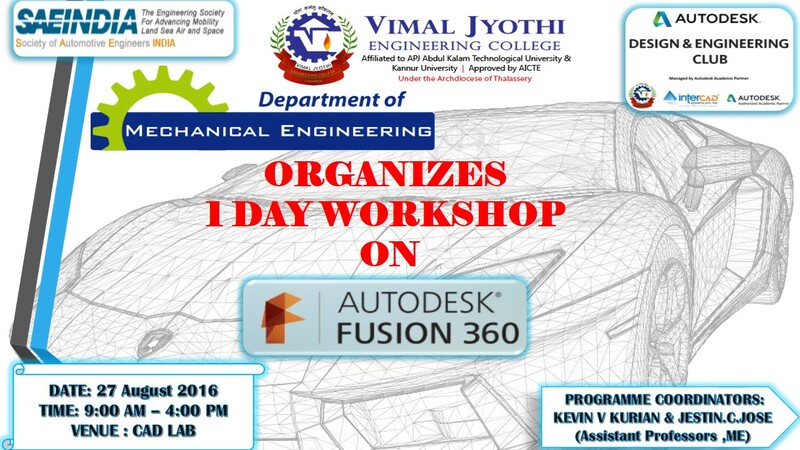 27-Aug-2016|1 DAY WORKSHOP ON FUSION 360 SOFTWARE. 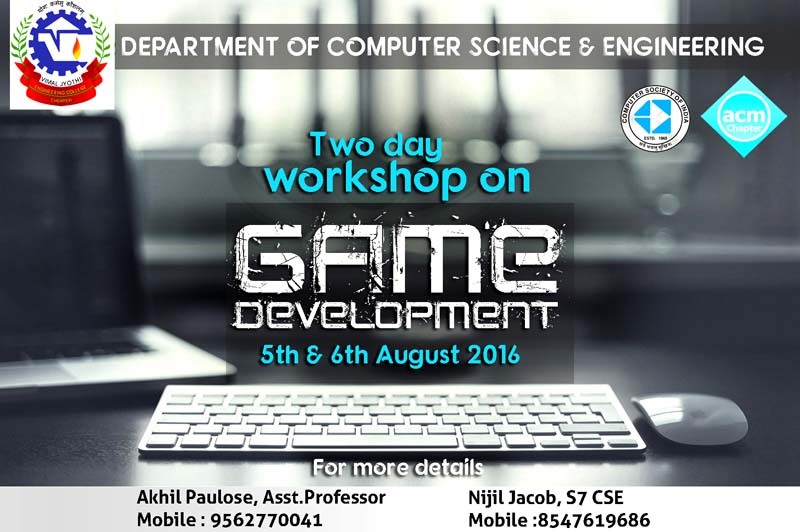 20-Aug-2016|Personality Development- Developing A Winning Approach In Life”. 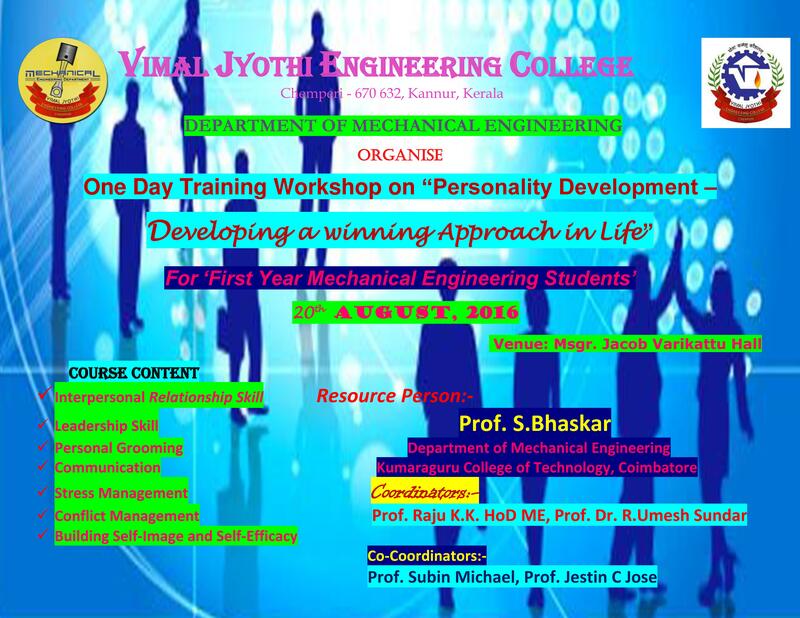 DEPARTMENT OF MECHANICAL ENGINEERING IS ORGANIZING ONE DAY PERSONALITY DEVELOPMENT TRAINING PROGRAM FOR S1 STUDENTS. TOPIC INCLUDE LEADERSHIP SKILL, PERSONAL GROOMING, COMMUNICATION, STRESS MANAGEMENT ETC. 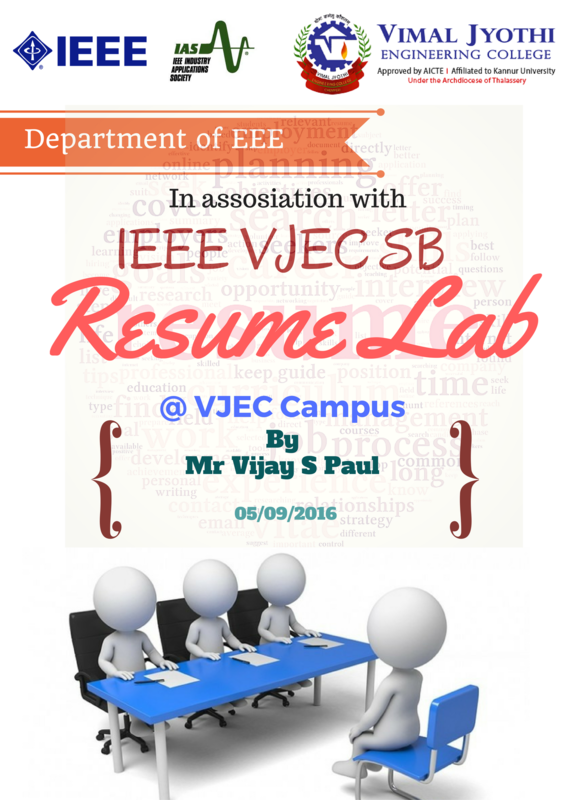 A one day hands on Workshop on "Tips for Writing a Resume". 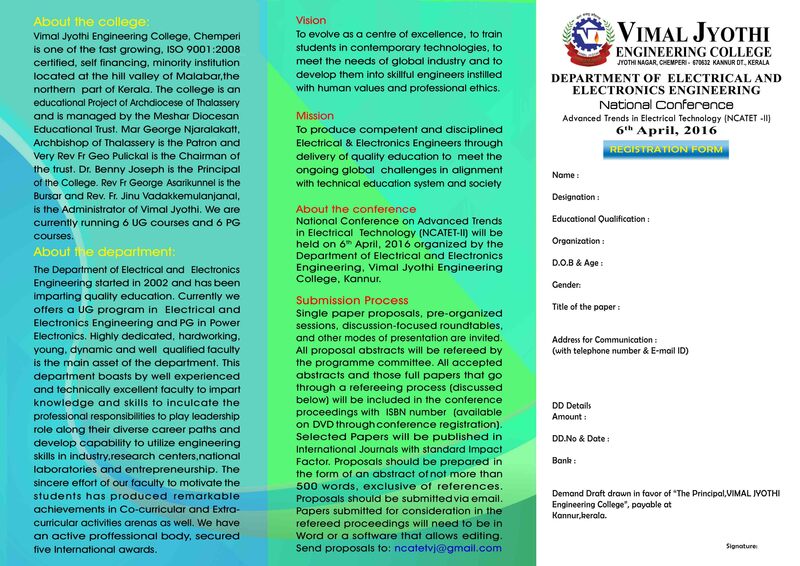 Department of Electrical and Electronics Engineering has been issued Newsletter, Electrical Gnosys August 2016, volume 6. The department of Electronics & Instrumentation has been issued newsletter METRON August 2016, volume 6. 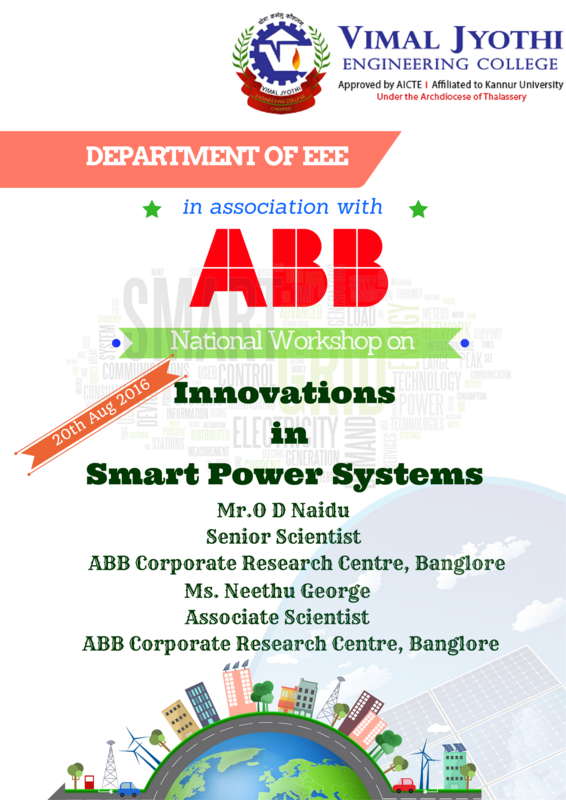 Date: 03 Aug to 6th Aug 2016 Workshop on Embeded System, planned by E&I Dept tobe held on 27th July is postponed to 3rd Aug 2016. 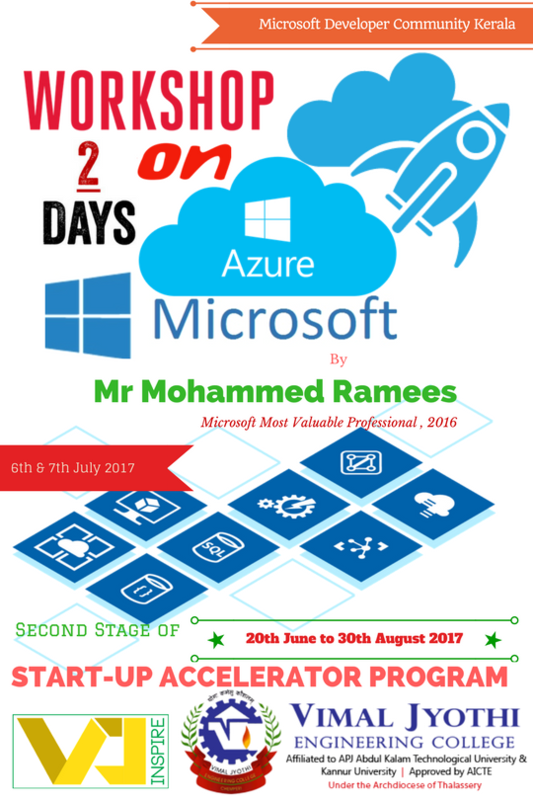 Three day Entrepreneurship Development programme “Startup i3 “ ( ideate, innovate, incubate ) in association with Kerala startup mission Government of Kerala on 28 th ,29 th and 30 th July 2016. 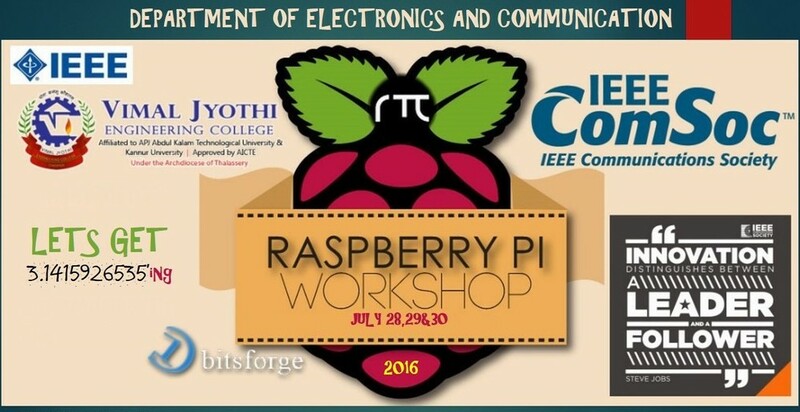 Department of Electronics And Communication is planning to organize 3 days workshop on Raspberry Pi from 28th July 2016 to 30th July 2016. 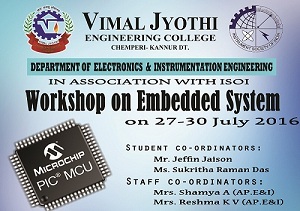 The department of Electronics & Instrumentation is planning to organise a four day workshop on Embedded System from 27 JULY to 30 JULY 2016. 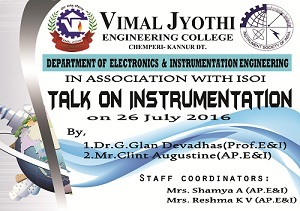 The department of Electronics & Instrumentation is planning to organise a one day Talk on Instrumentation on 26 JULY 2016. 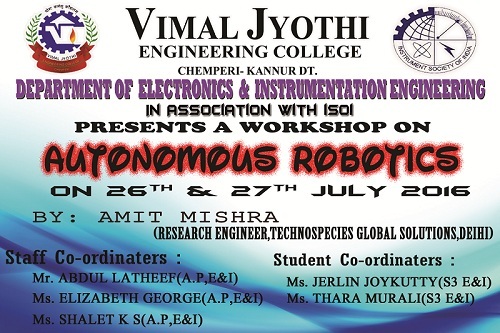 The department of Electronics & Instrumentation is planning to organise a two days workshop on Autonomous Robotics from 26 JULY to 27 JULY 2016. 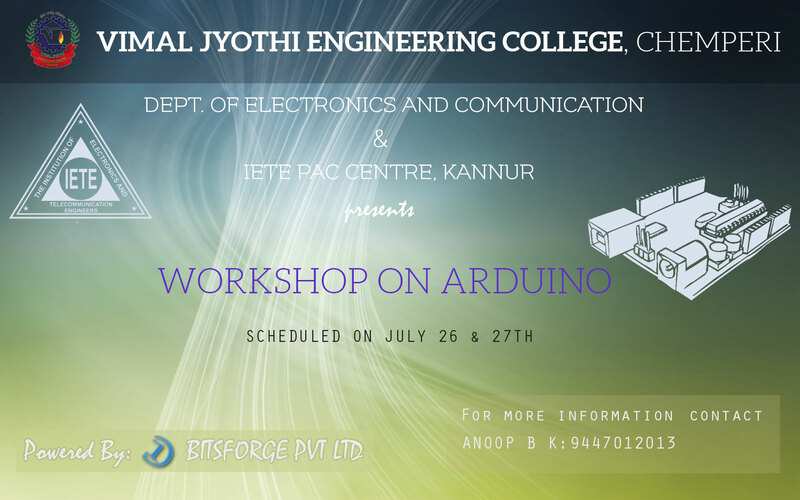 The department of Electronics & Communication And IETE Pac centre is planning to organise a Two day workshop on Arduino from 26 JULY to 27 JULY 2016. 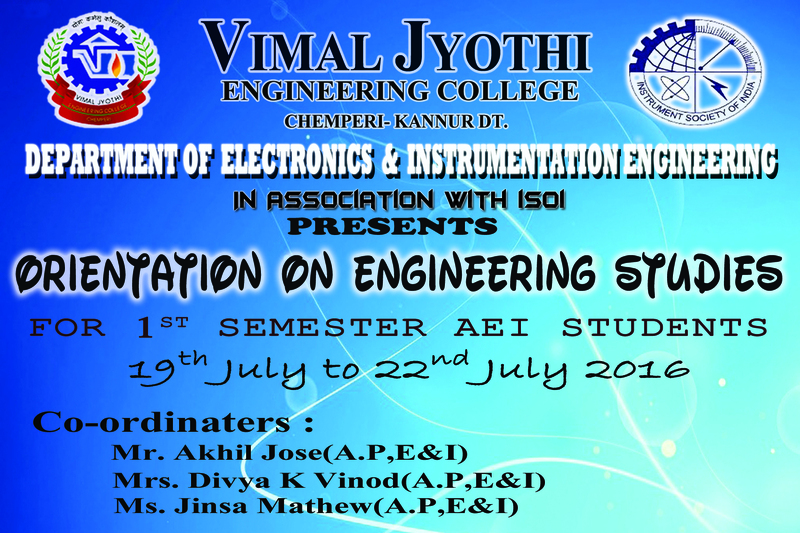 In order to increase industry oriented skills of the students, the Department of Electrical and Electronics engineering is planning to organise a Semester long program on “ Embedded system programming” . 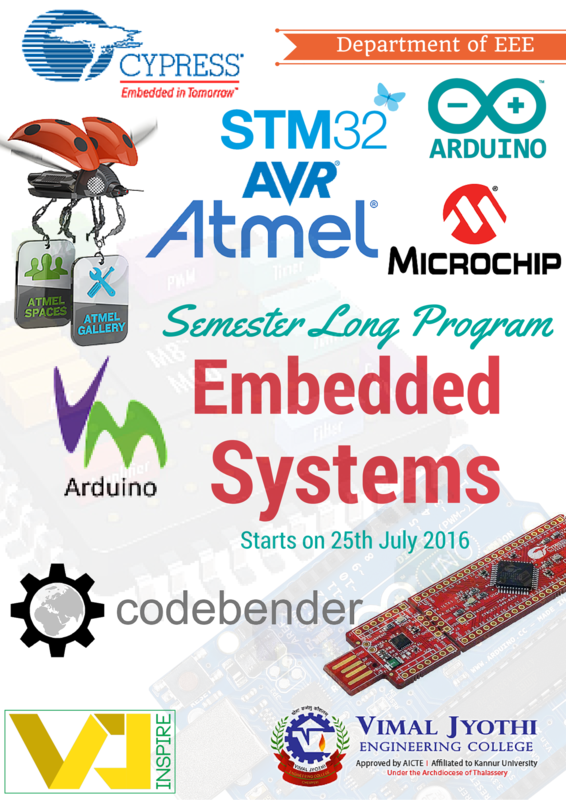 As an initiative of the same, we are planning to organise a two day workshop on “ Atmel AVR microcontrollers and Cypress PSoC ” on 25th and 26th July 2016 using Arduino, Atmel studio, PSoC Creator with Atmel AVR and PSOC 4. 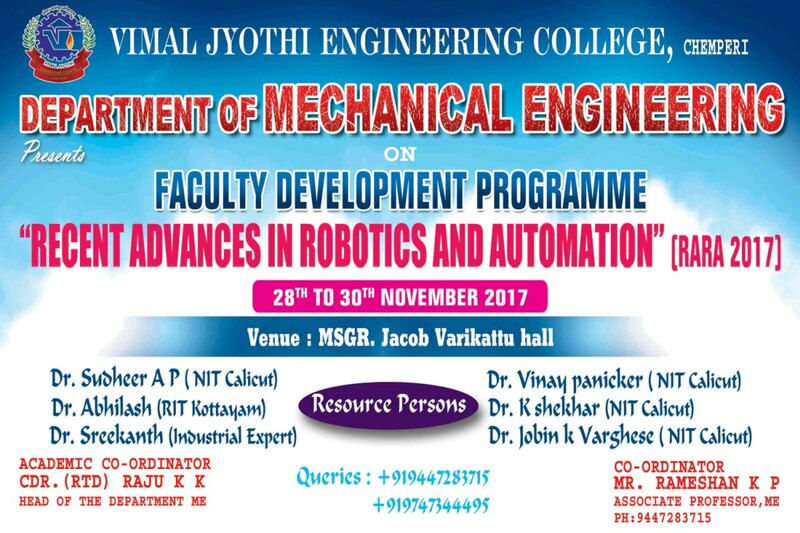 In order to increase industry oriented skills of the students, the Department of Electrical and Electronics engineering is organising a Semester long program on “ Programmable Logic controllers” . 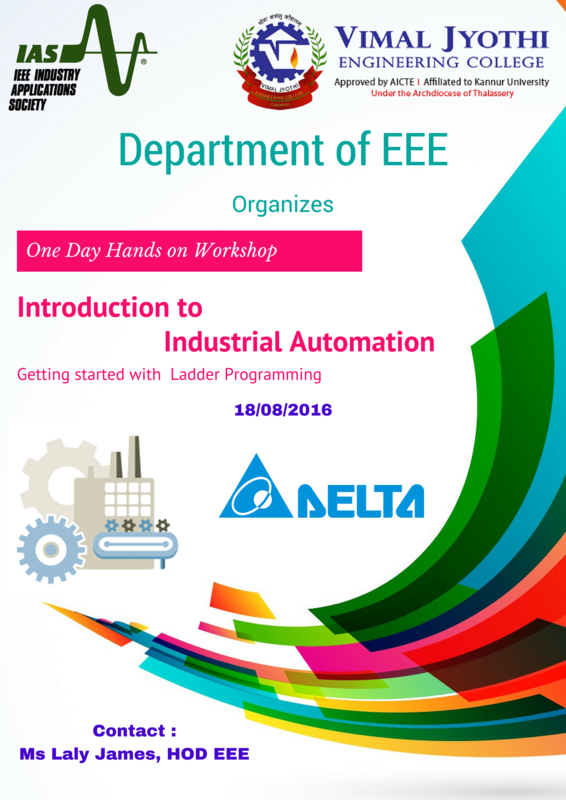 As an initiative of the same, we are planning to organise a one day workshop on “ Ladder programming of Programmable Logic controllers” on 15th July 2016 using Zelio relay logic. This will be followed by hands on sessions on Delta DVP SX using WPL soft and Allen Bradley Micrologix 5000 PLCs. 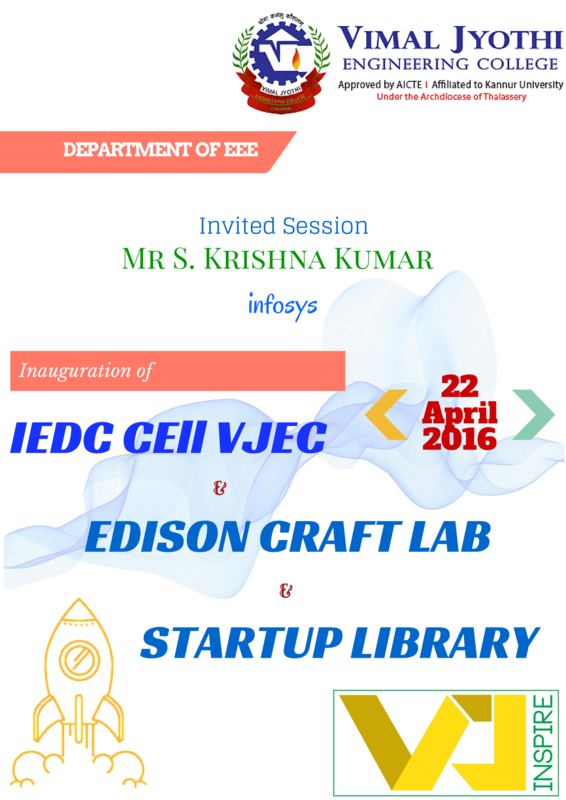 Department of ECE conducted a national level project competition 'DEXTRA' On March 2016. 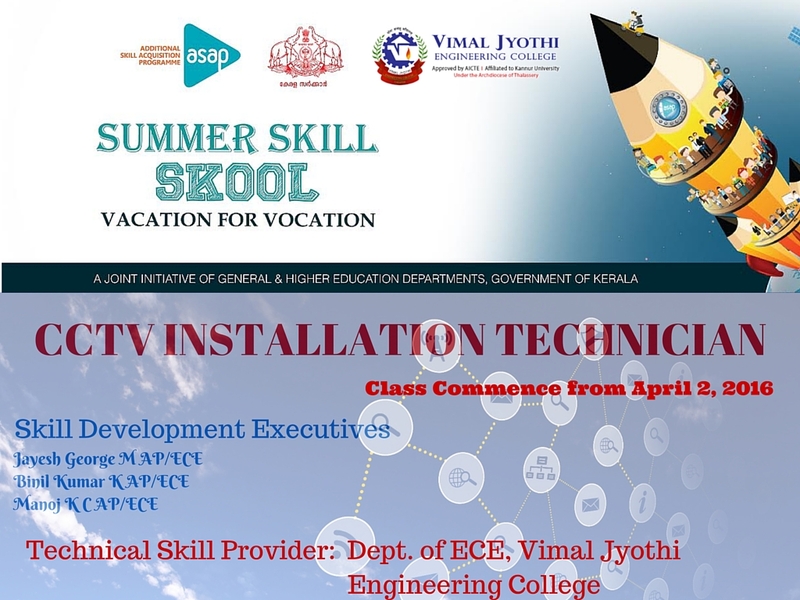 In association with ASAP conducted a summer training on "CCTV INSTALLATION TECHNICIAN". A technical talk on Pico satellites in assocaition with IEEE communication chapter by Dr.sadasivappa G, HOD of Department of Telecommunication Engineering, RV Engineering College Banglore. 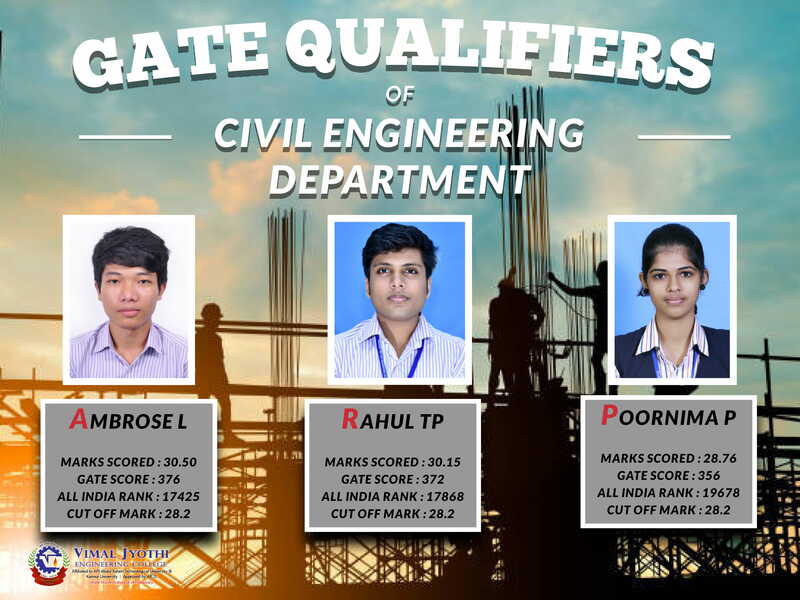 Mr Robin Thomas of S5 EEE has been selected for the International Project Competition organized by NXP Technologies - Semiconducting division of Philips Electronics in association with Hackster.The website of IEEE IAS ,designed by Ashige Ganesh of S6 EEE has won second prize in chapter web contest. 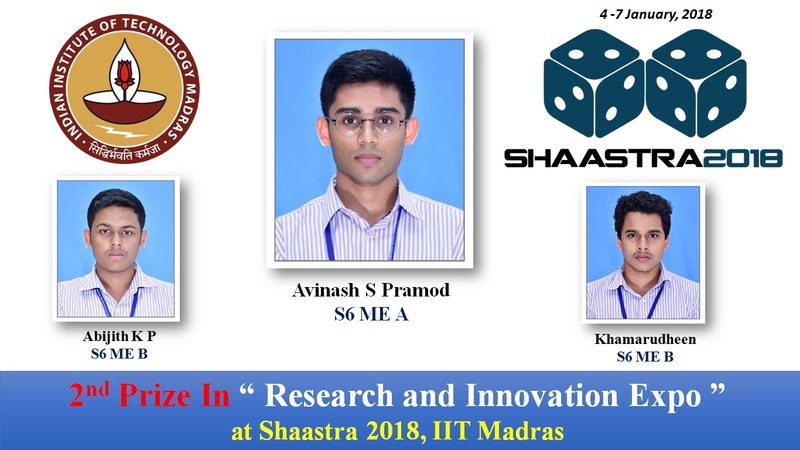 Three of the Third year students Mr. Akhil Joseph, Mr. Akhil Thomas & Mr. Jesbin Tho- mas of Applied Electronics & In- strumentation got selected for the Innovation Management Certifica- tion Workshop at Siemens, Goa from 18th to 22nd April 2016. 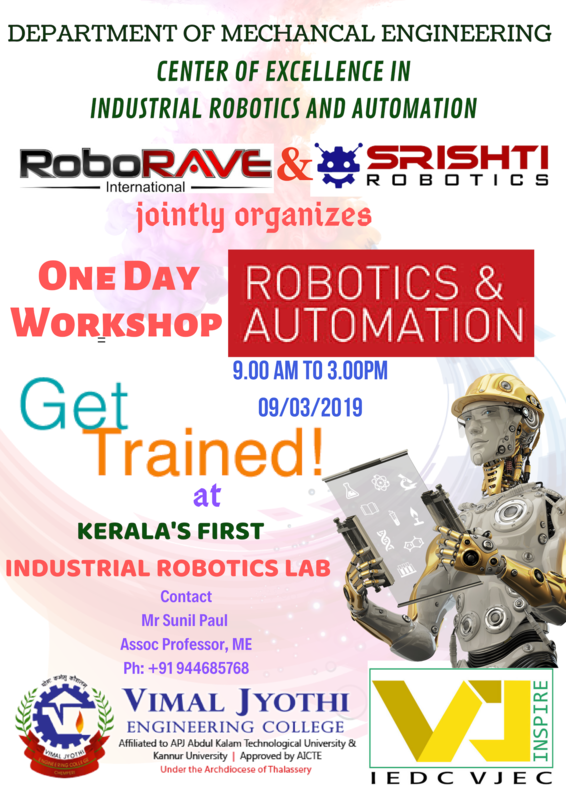 In collaboration with Prolific Industries, Cochin have given a One month training for the final year students (2012-2016) to make them ready for the industrial requirement. Mr. Clint Augustine & Mr. Vineed .T Govind were the coordinators for the event. 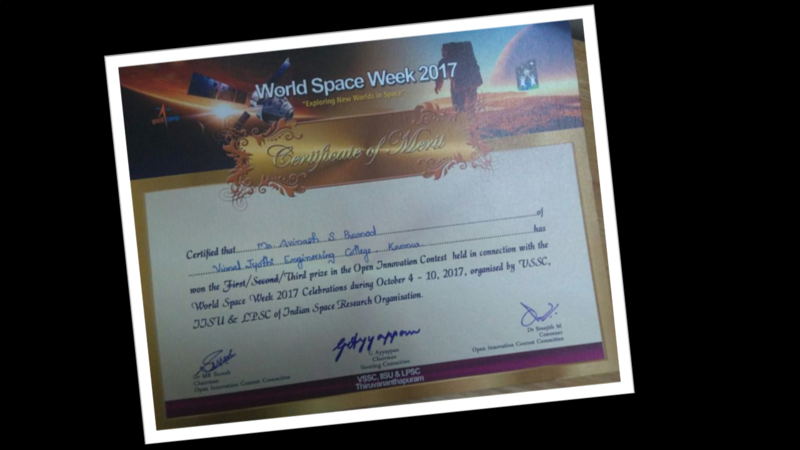 Special congratulation to Ms. Sigi Thomas , Dr. Nidheesh P.V and team for Kerala Govt Certification for the Environmental lab.  Value Added program on stad pro. Technical training seminar on “UPGRADE TO UPDATE” A Joint initiative of Metrolla steels Ltd and Indian Concrete Institute (ICI). 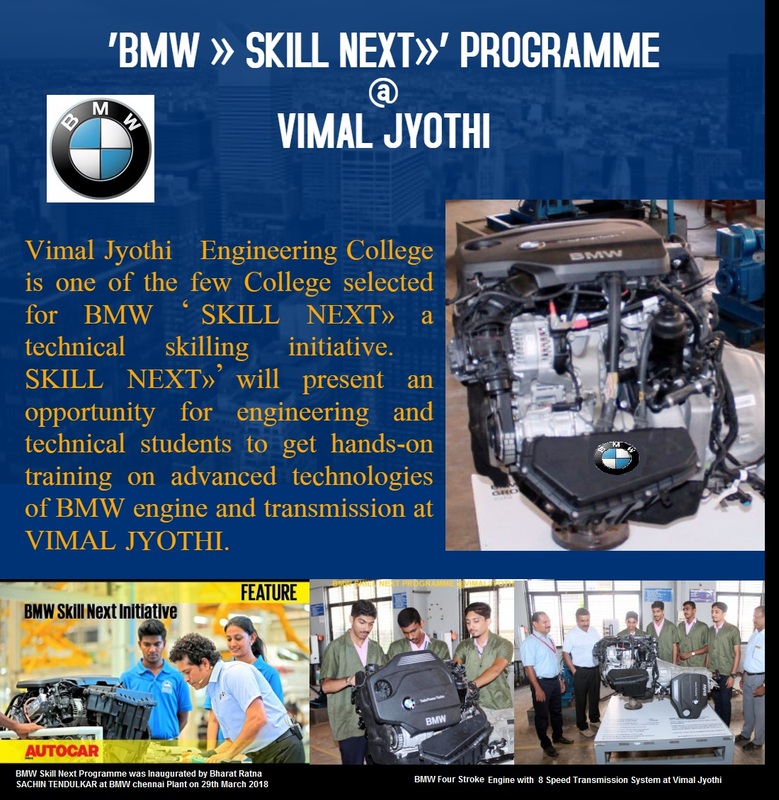 Infosys soft skill training was a 5 day program conducted by the college management on behalf of Infosys at the auditorium of Vimal Jyothi College of Engineering. 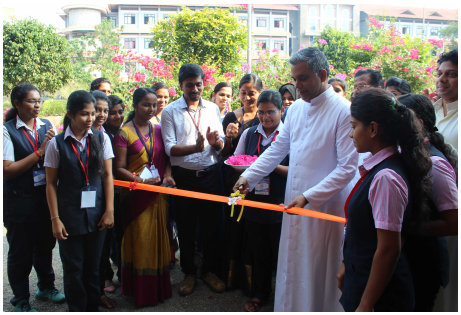 The program was inaugurated by the chairman of the college Fr.Rev Dr Thomas Melvattom. 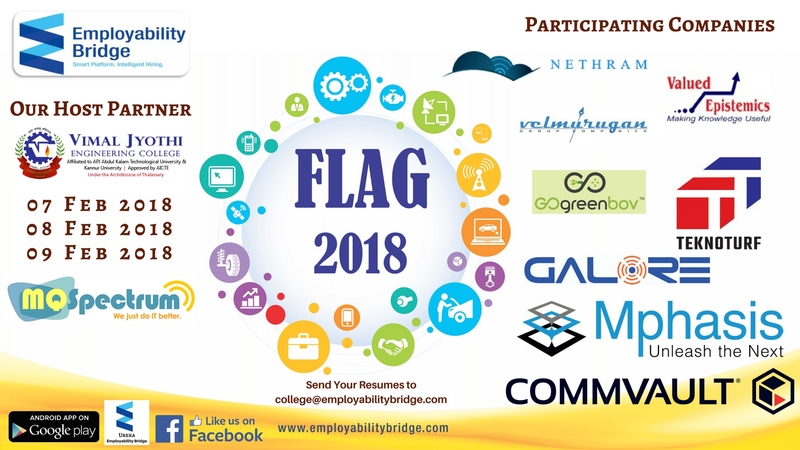 Some of the prominent industries our students got placed in Babte , TCS , UST Global , In app ,Kites Software all sec , Esco graphics etc. 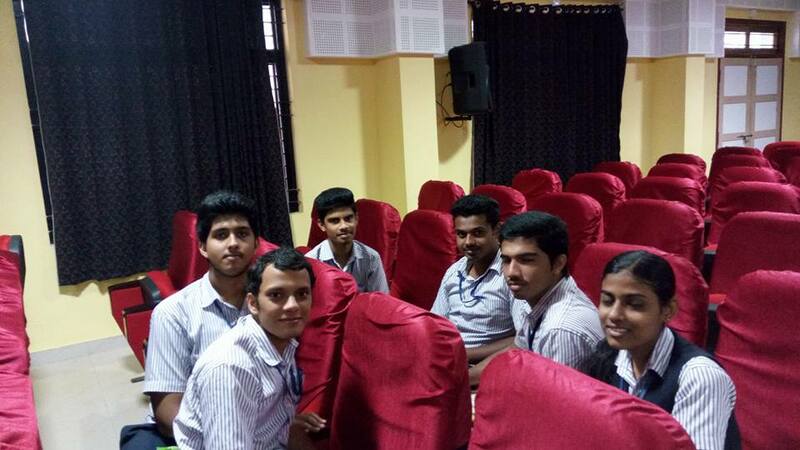 As part of academic curriculum and evolving the skill set among S6 students, in association with the Intercad systems 1 week training programme on latest AutoCAD 2016 & Primavera P6 software was organized at college from 23 April 2016 to 28.April 2016. 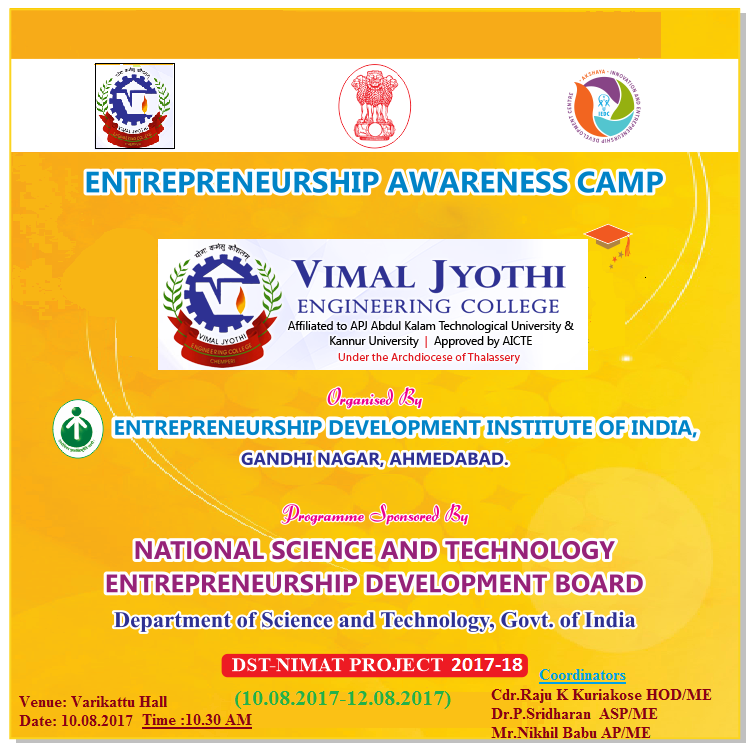 Department of EEE organised a Awareness Program " Start up Avalanche“ under VJ Inspire Entrepreneurship Accelerator Program. 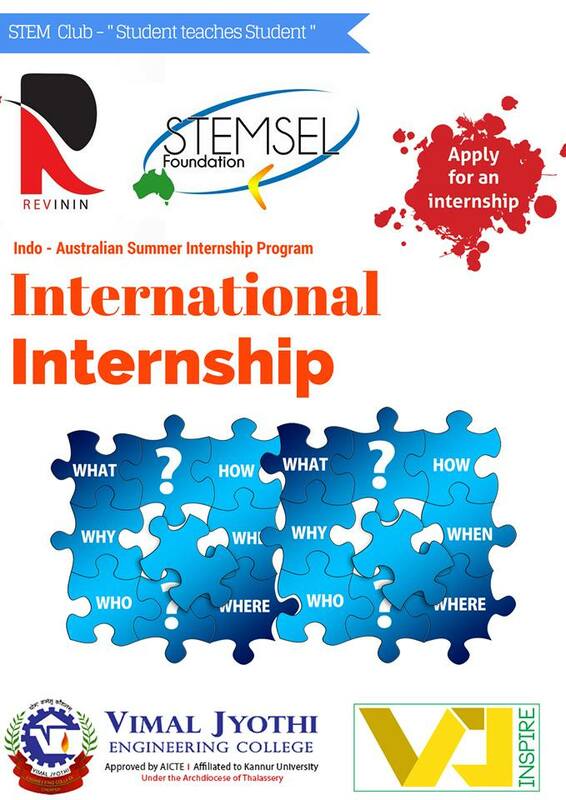 tudents of Department of EEE has successfully completed a semester long Training Program conducted by StemSel Foundation Australia under Indo Australian Training Industry Interactive Training Program. 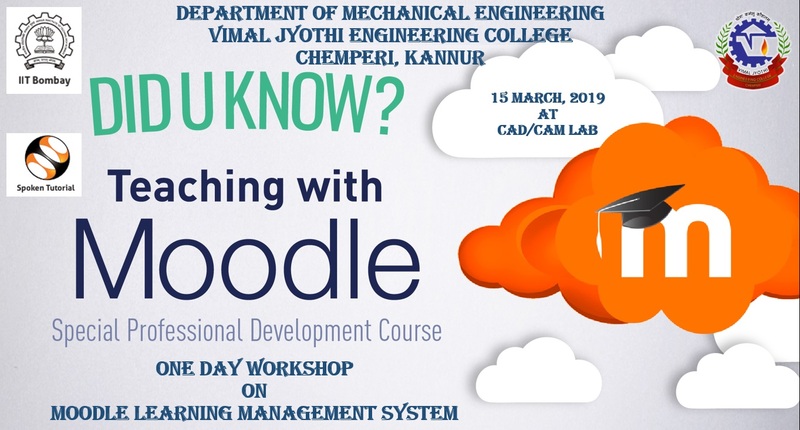 Students (Mr Sacheth Sanal , Mr Jithin Vidya Ajith, Mr Robin Thomas and Mr Aswin George ) has successfully trained on eLab Electronics Development Board and IDE including topics on GPIO, ADC, DAC, USART, Interrupts, Timers , PWM and many working experiments . As a final evaluation of the training, they have successfully completed a one month long project on "Android App based Home Automation using eLab Electronics Development Board and ESP8266 WIFI ". 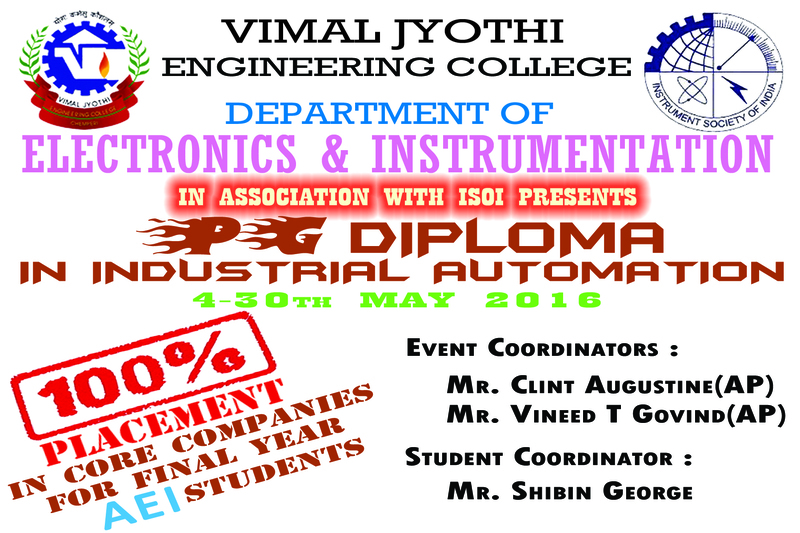 Department of Electronics & Instrumentation is organising a PG diploma program for all Applied Electronics & Instrumentation students from 4-30th of May 2016. 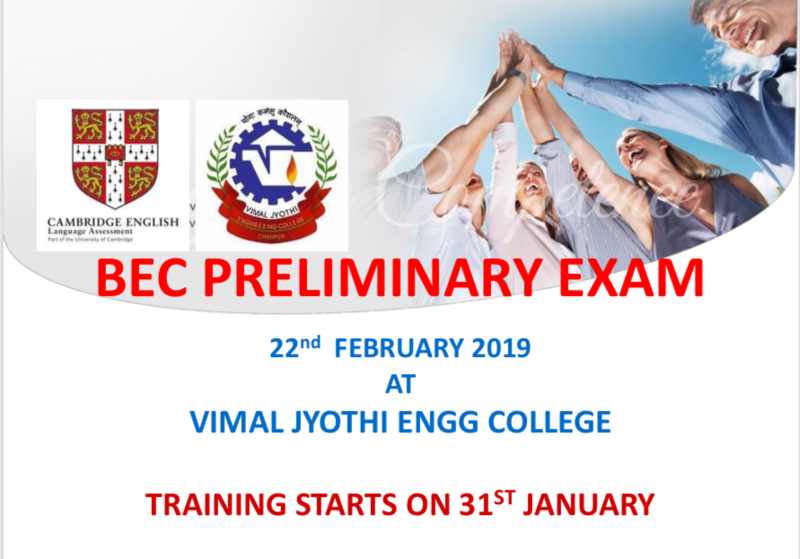 The course will ensure 100% placement for all the final year AEI students. Department of Electrical and Electronics Engineering and Stemsel foundation Austalila has signed an MOU on Industry Interactive Training to train the students to international standards. 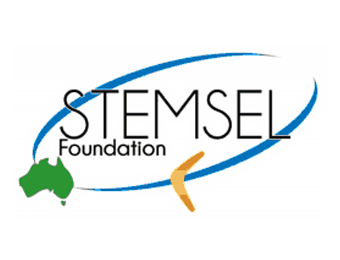 Currently Stemsel is training a group of six Electrical Students under this scheme. 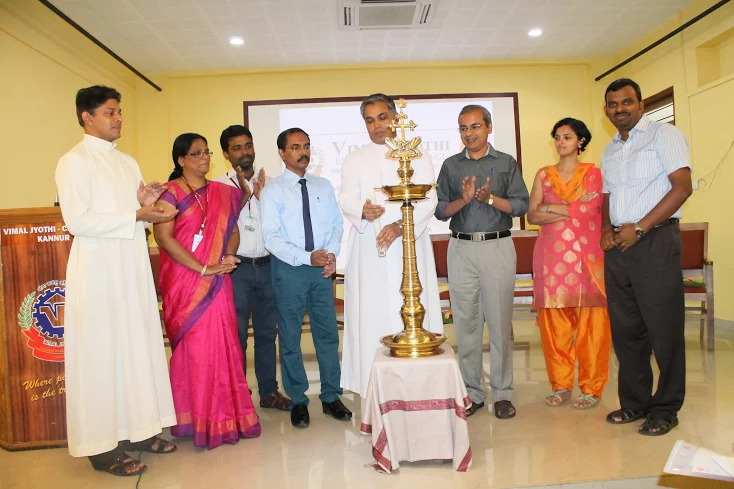 It’s great honour and privilege that ACM Chapter was inaugurated by chief guest Dr. Sabu M. Thampi, the ACM chair, Trivandrum on 1st April at Msgr. Jacob Varikattu Hall by lightning the lamp which alights the heart of the students & faculty members attended the function. 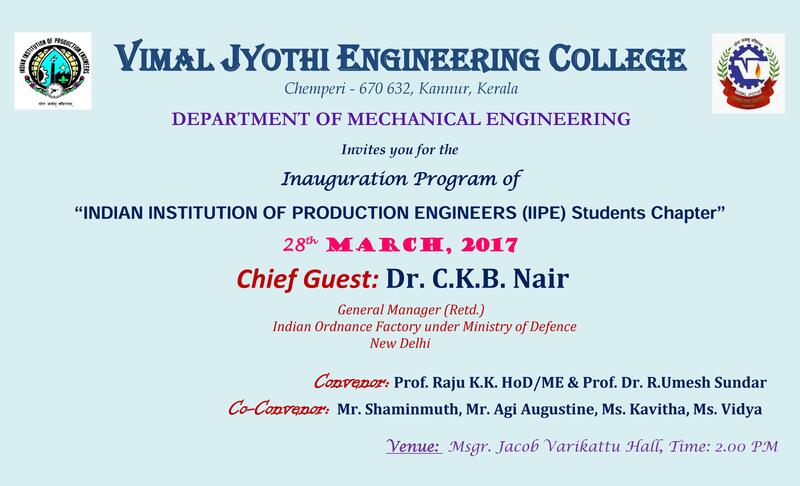 Mr. Manoj V Thomas ,HOD of CSE Department whole heartedly welcomed everyone to the historic occasion . The presidential address was delivered by Principal Dr. Benny Joseph. During the inaugural speech Dr Sabu M Thampi elaborated on the benefits of being an ACM Member . He motivated the audience to be ACM members and then described the countless opportunities ahead. Rev. 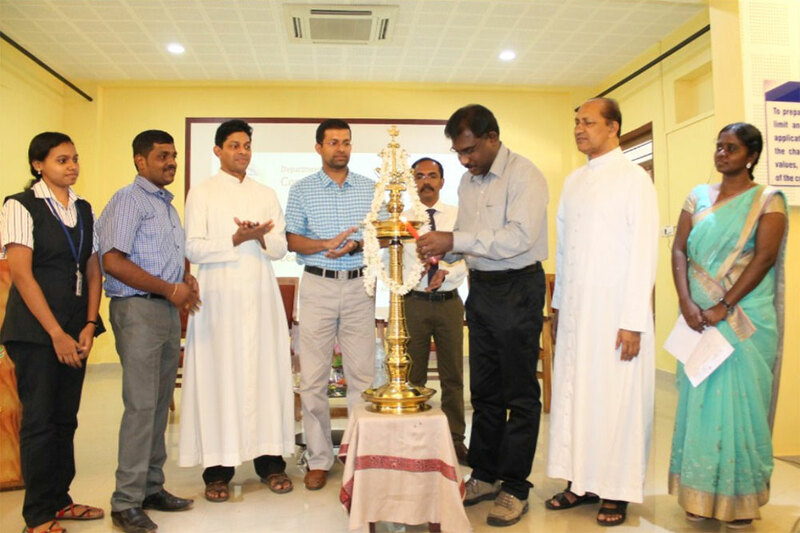 Fr Geo Pulikal our chairman addressed the blessing speech for divine sanction & inspiration. The felicitation was presided by administrator, Fr. Jinu vadakkemulanjinal , ACM Faculty sponsor Ms. Divya B and vote of thanks by Ms. Jisna Jayadevan, ACM Chair ,Student chapter . 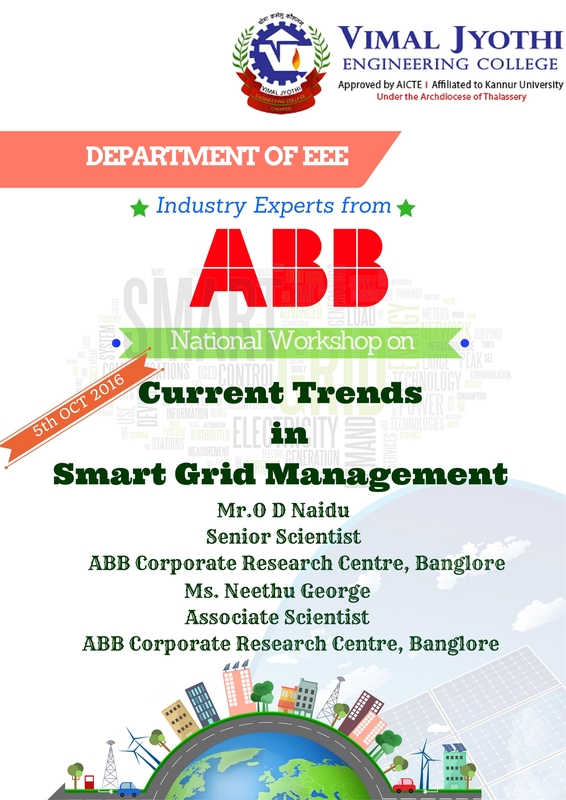 The session was followed by the expert talk on ‘Machine Learning in Cyber Security by Dr. Sabu M Thampi . His views & thought on the topic inspired and motivated everyone. It turned out to be a fruitful interactive session. At last the session was winded up by handing over the Memento to the guest by HoD. 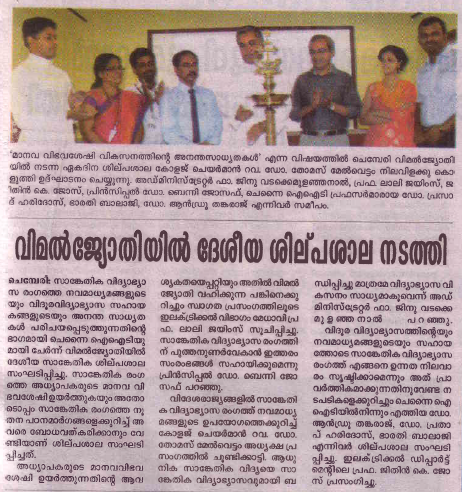 Department of Civil Engineering is conducting a National Conference “INNOVATION IN CIVIL ENGINEERING" on 6 th May 2016 , One day workshop on SUSTAINABLE HABITAT was organised in association with THE LAURIE BAKER INTERNATIONAL SCHOOL OF HABITAT STUDIES TRIVANDRUM,GOVERNMENT OF KERALA on 19th March 2016, a short term training programme on “Art of writing Technical articles” on 21.03.2016. 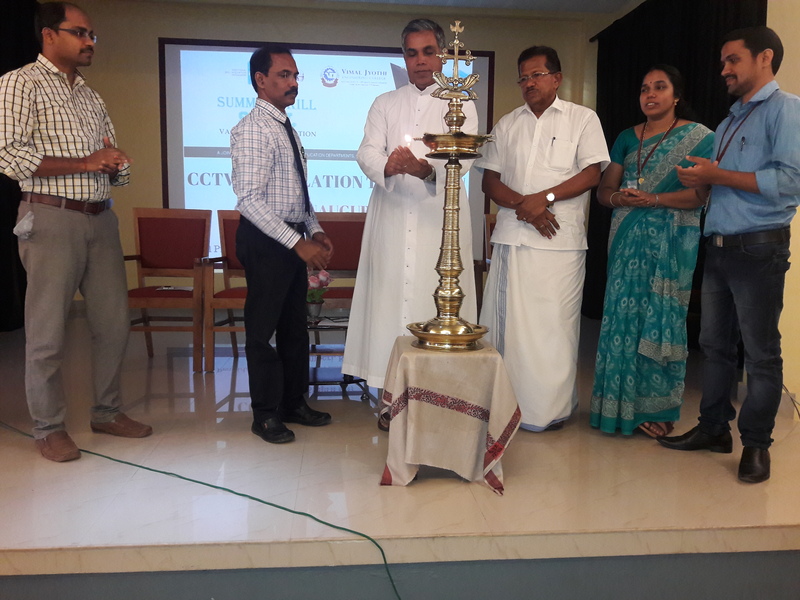 ACM Student Chapter under the department of CSE has been inaugurated on 1st April by the Chairman of Trivandrum ACM Chapter - Dr. Sabu M Thambi. 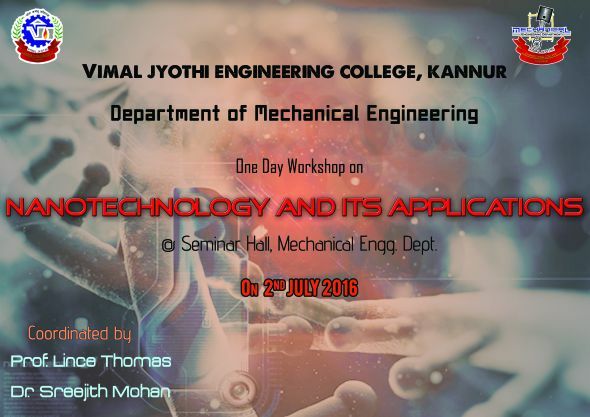 FIVE DAY HANDS ON WORKSHOP ON “INDUSTRIAL APPLICATIONS OF ELECTRICAL CADD” A Five Day Workshop on Computer Aided Design and Manufacturing was held in our college under for the benefit of the students. We had classes on AutoCAD Interface in detail for 2 days and Practical classes on Electrical Drawing were handled.